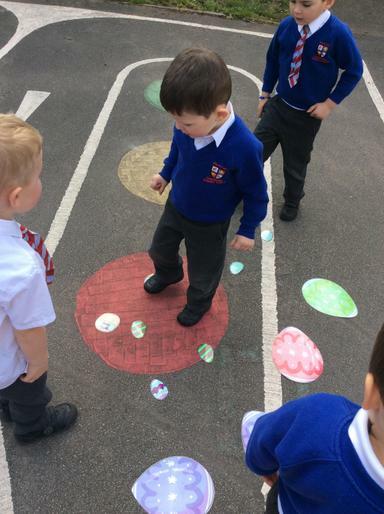 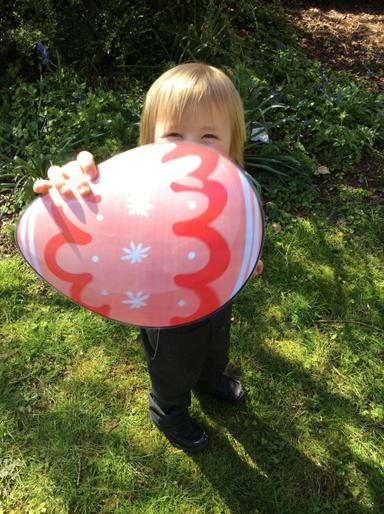 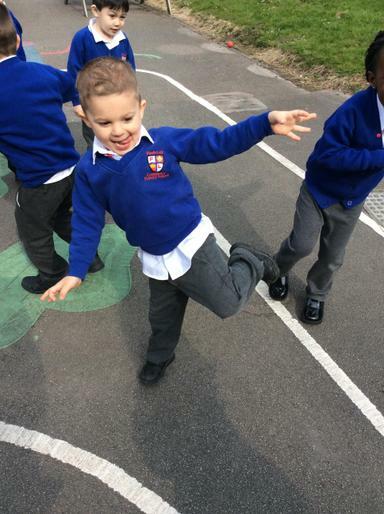 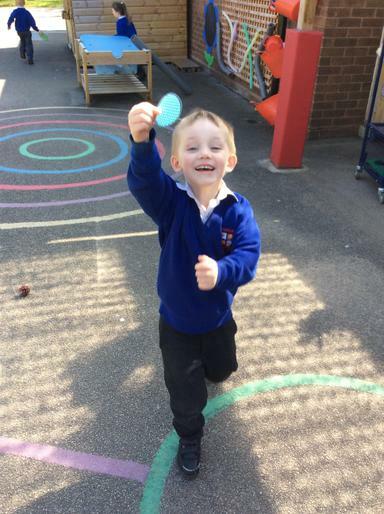 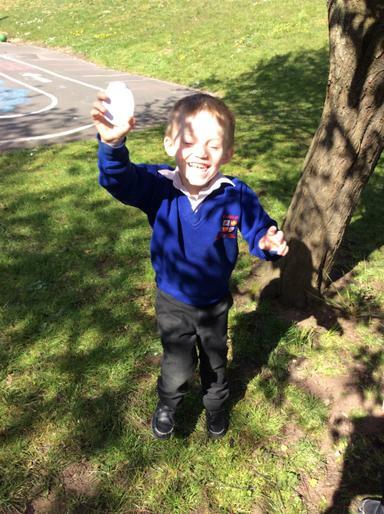 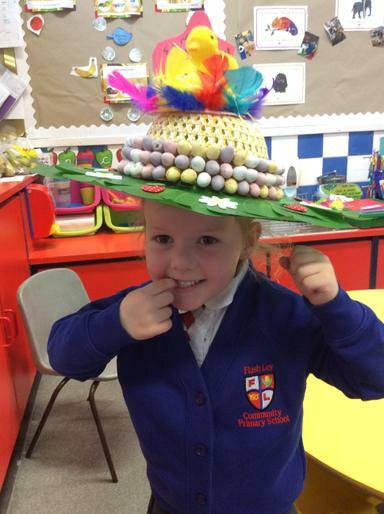 Week 28 - We have enjoyed an Easter week this week. 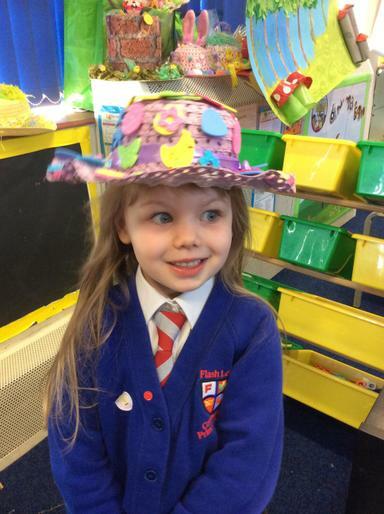 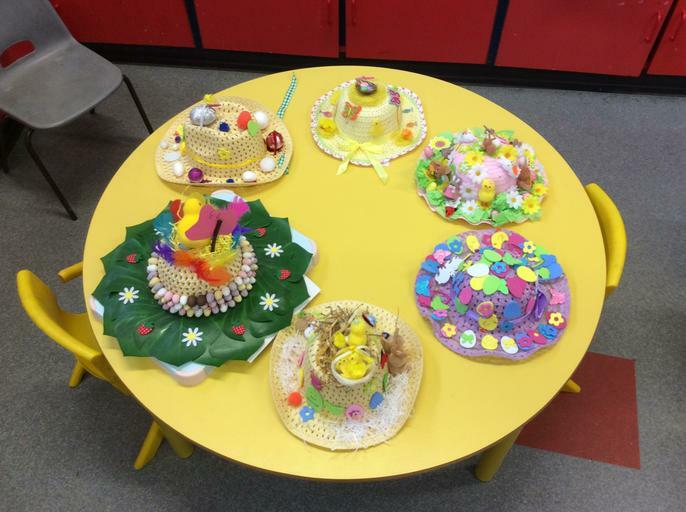 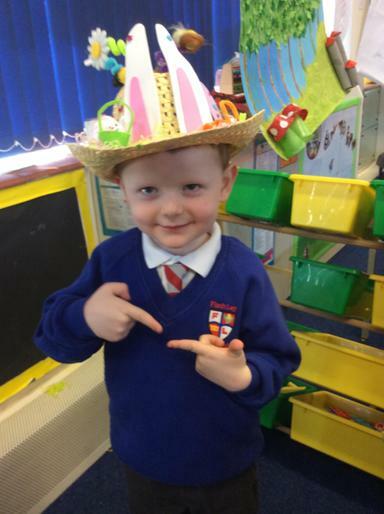 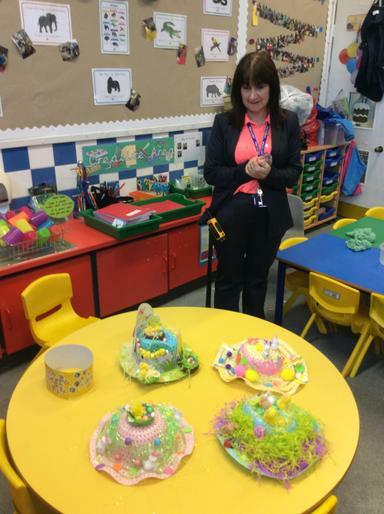 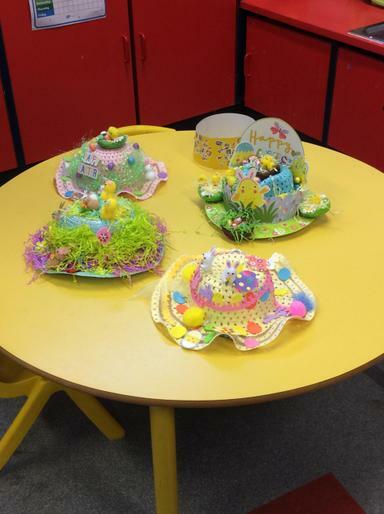 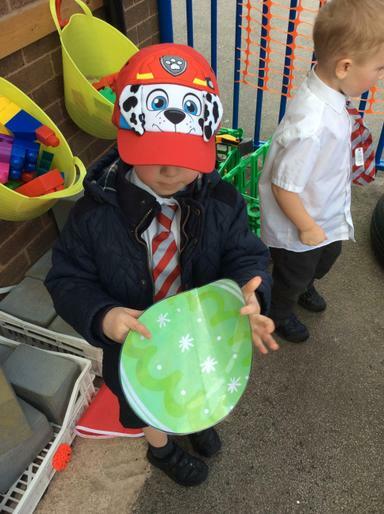 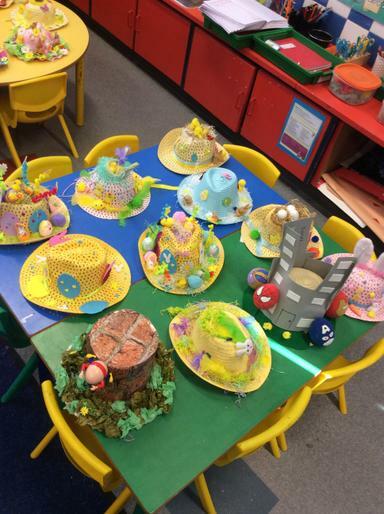 The children designed Easter eggs, completed an Easter egg hunt and entered some amazing bonnets in our Easter bonnet competition! 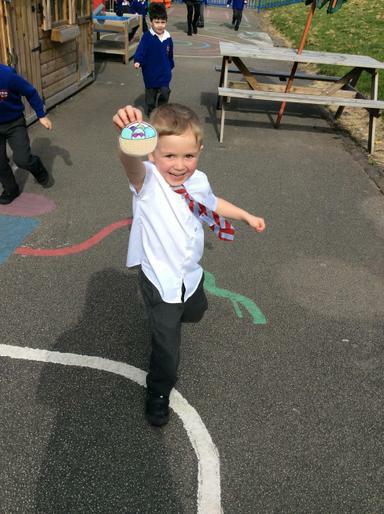 We learnt a new game coconut rush and enjoyed trying to be the team with the most coconut beanbags on our island! 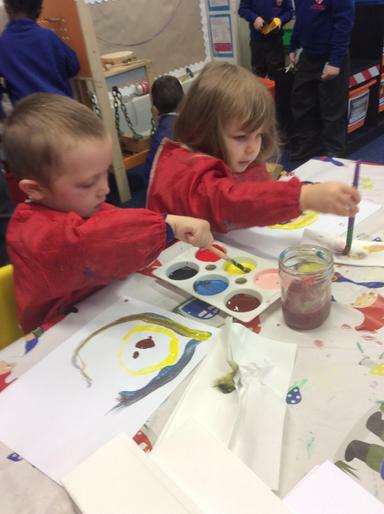 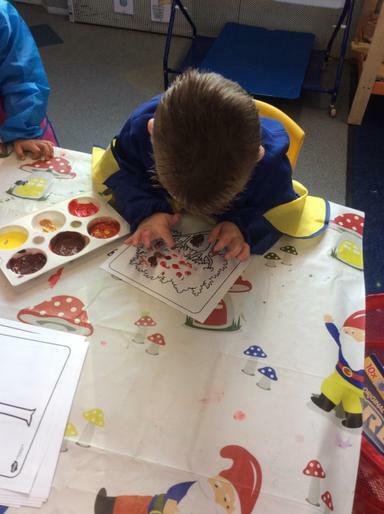 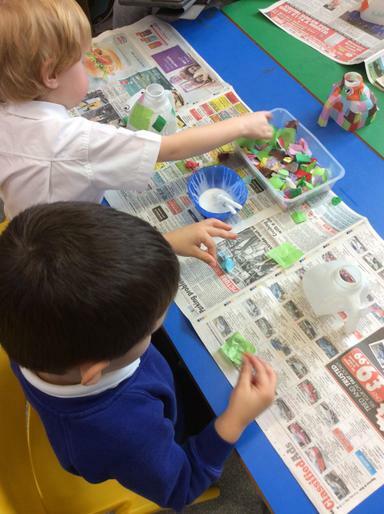 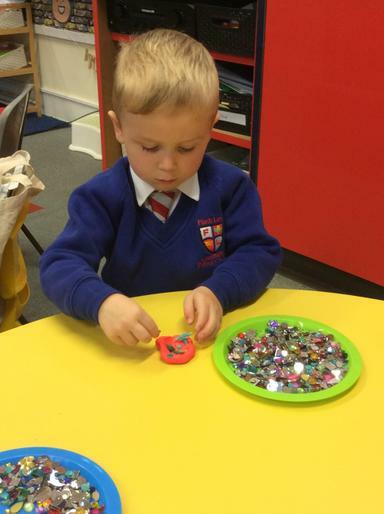 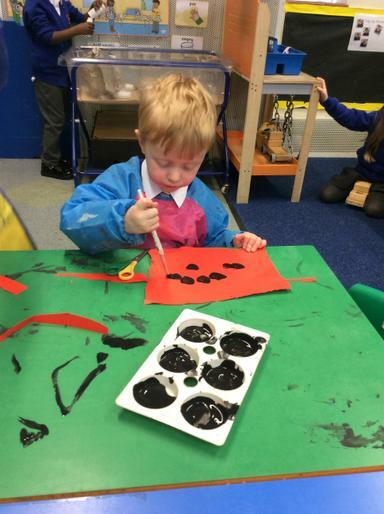 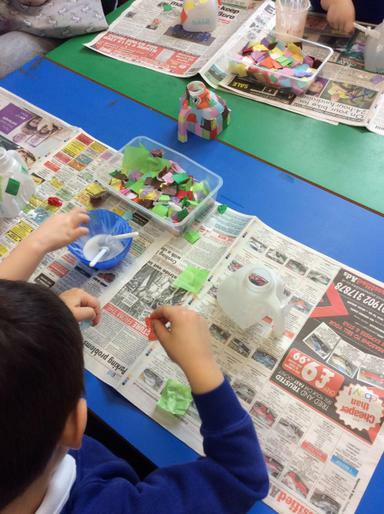 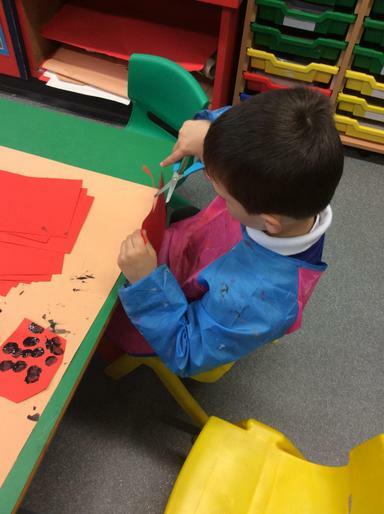 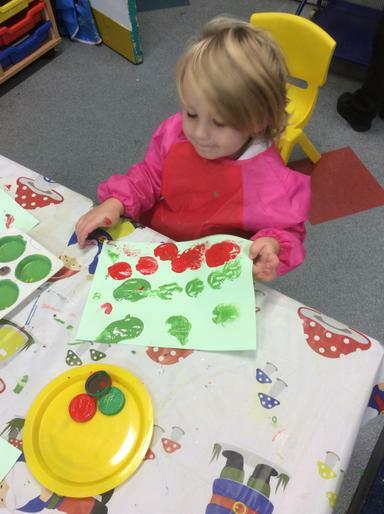 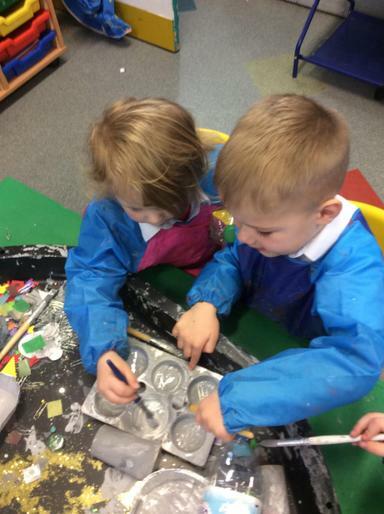 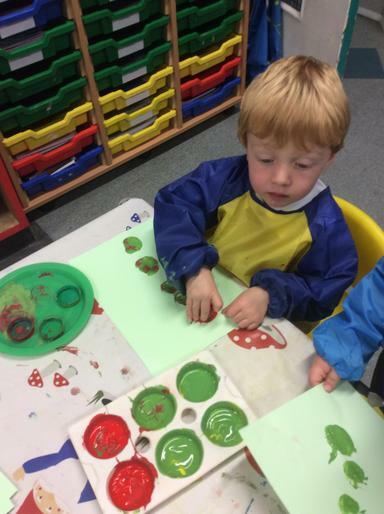 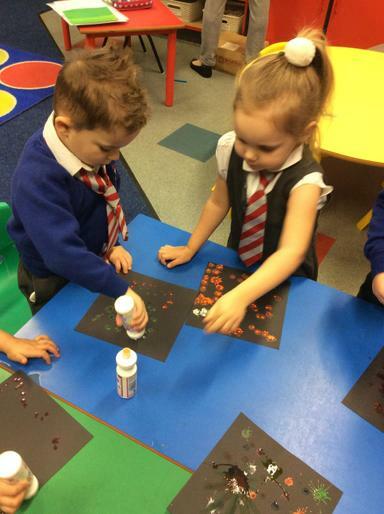 Week 27 - We have had fun getting physical this week as we painted, cut and designed ladybirds from our story the bad tempered ladybird. 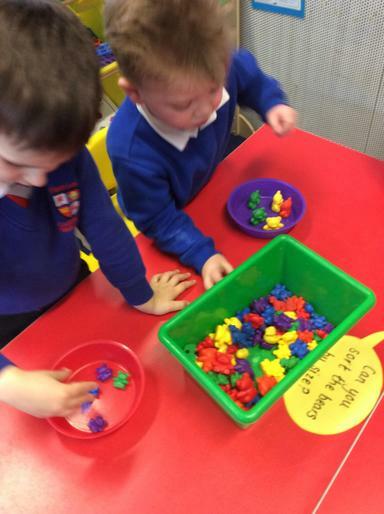 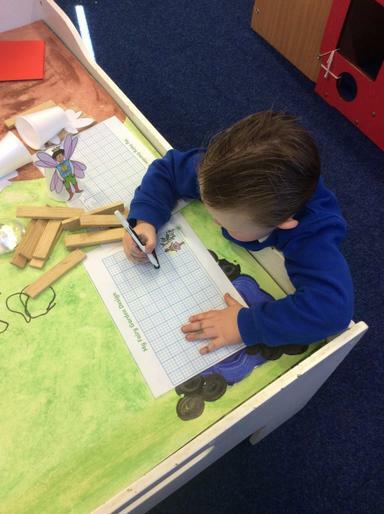 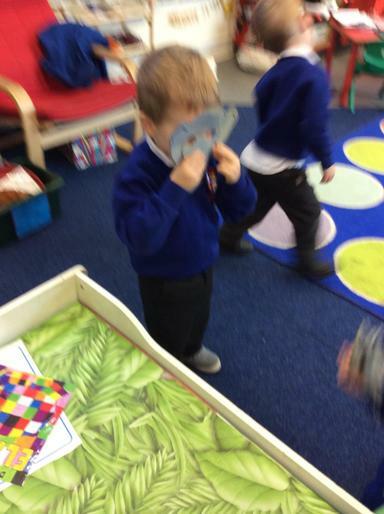 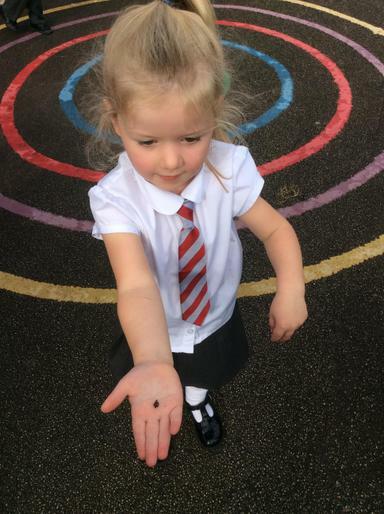 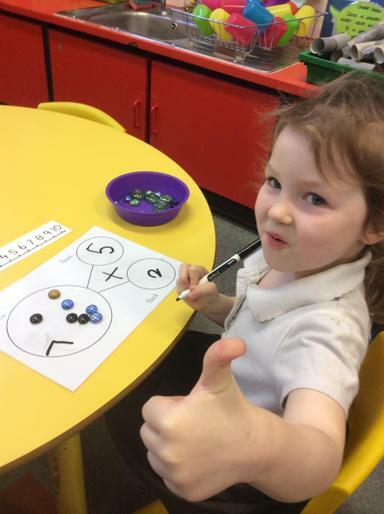 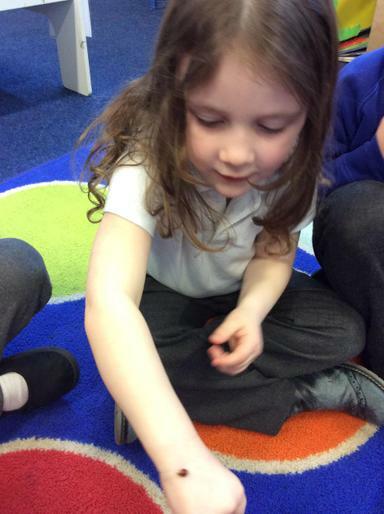 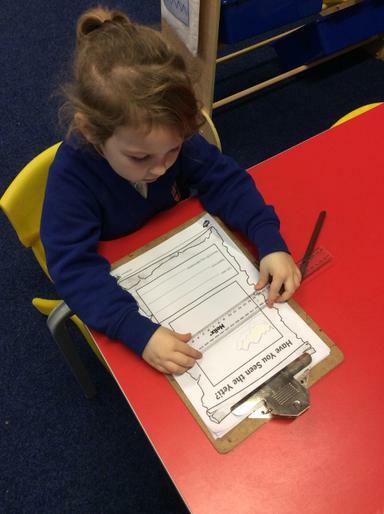 We talked about feelings, counted spots on ladybirds and recorded the number as well as hunting for ladybirds outside. 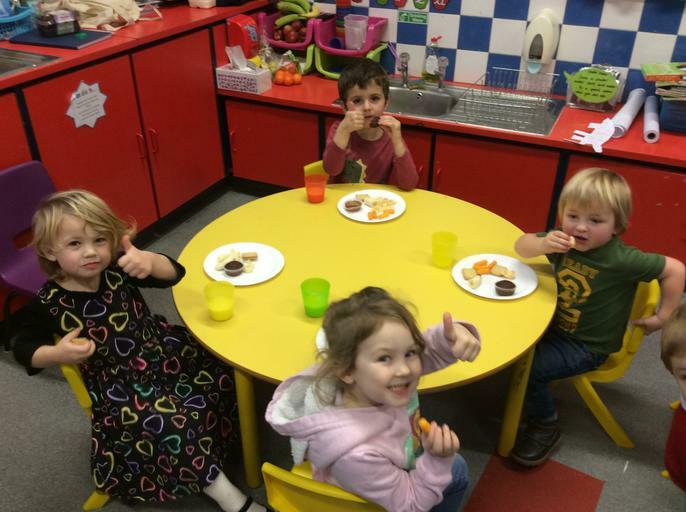 Week 26 - It has been a jam packed week. 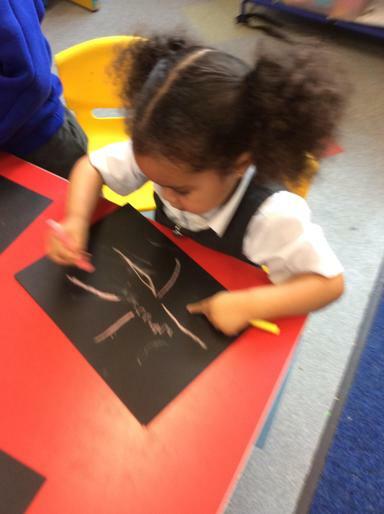 We enjoyed the story Spinderella and explored Spiders. 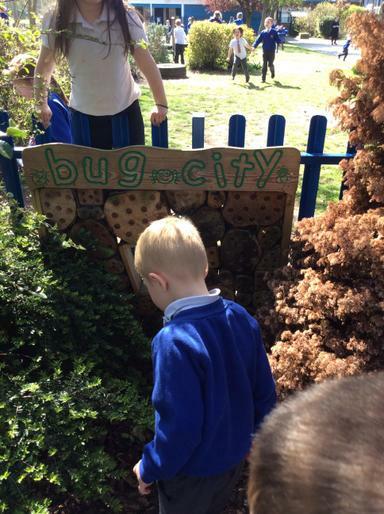 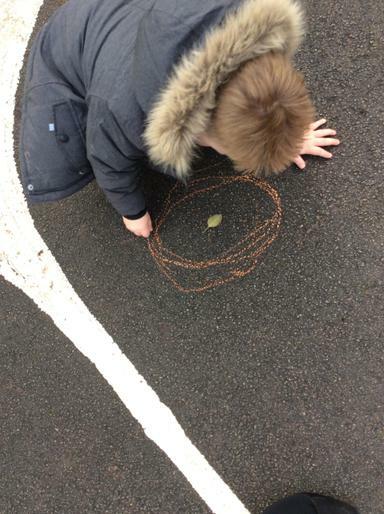 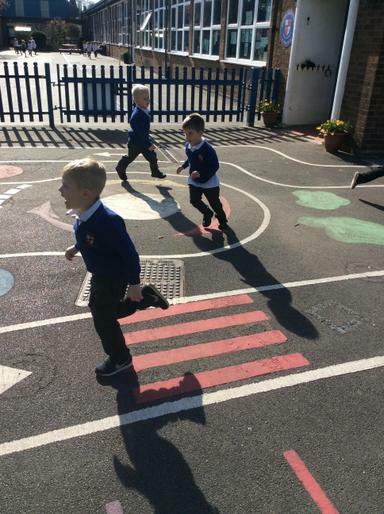 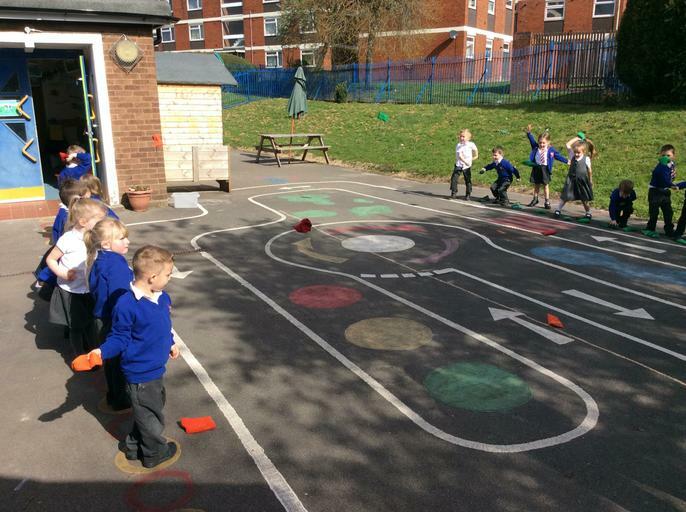 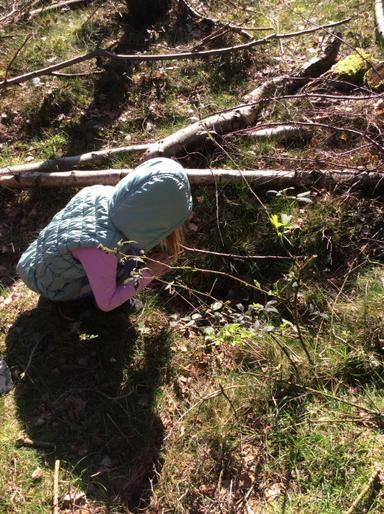 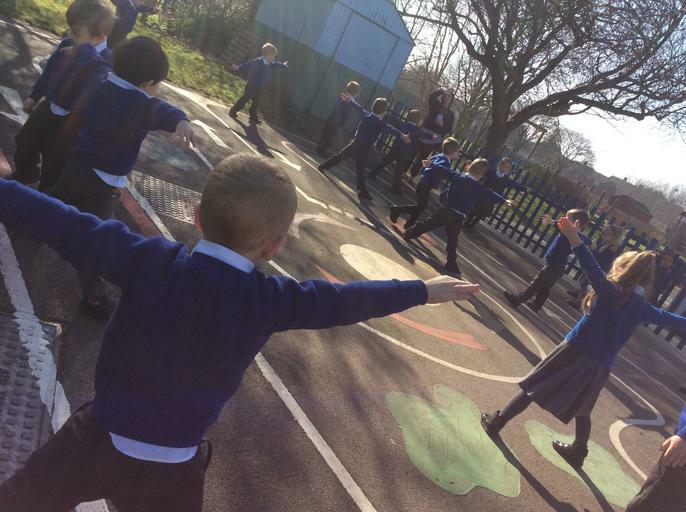 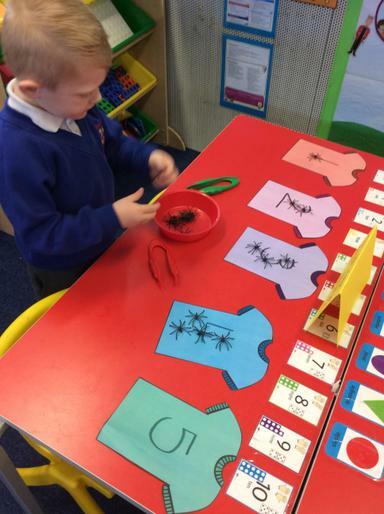 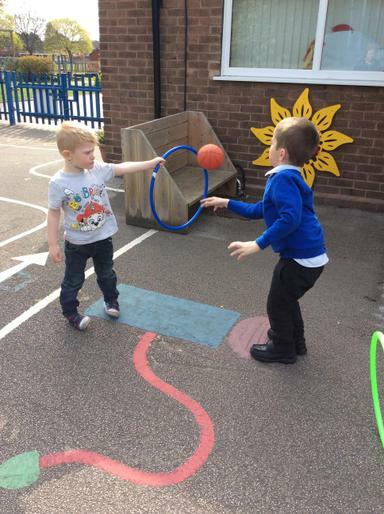 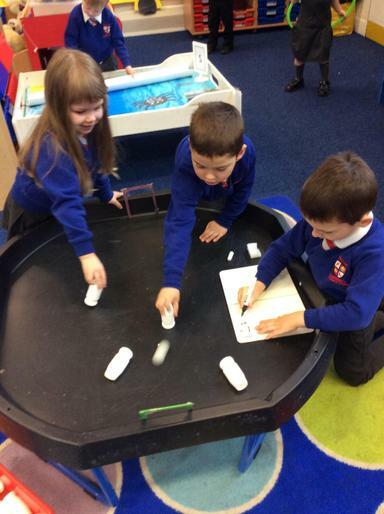 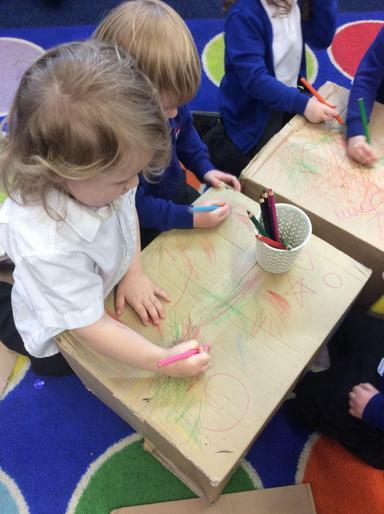 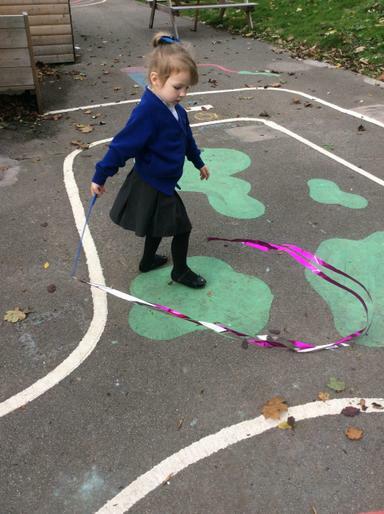 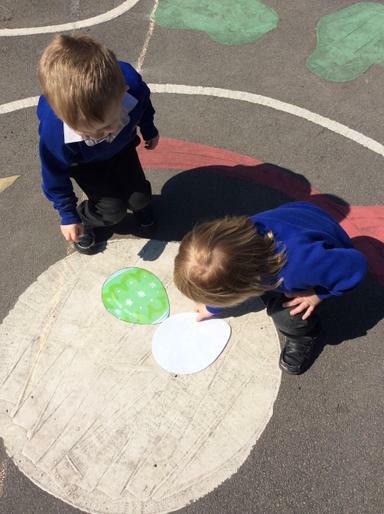 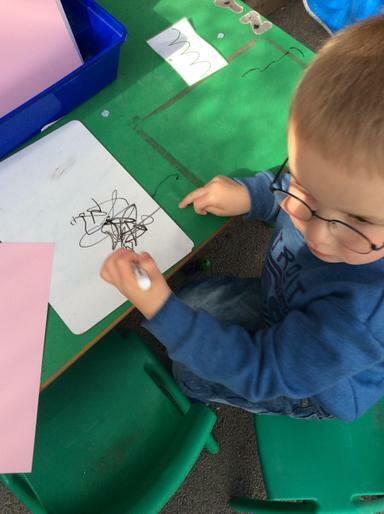 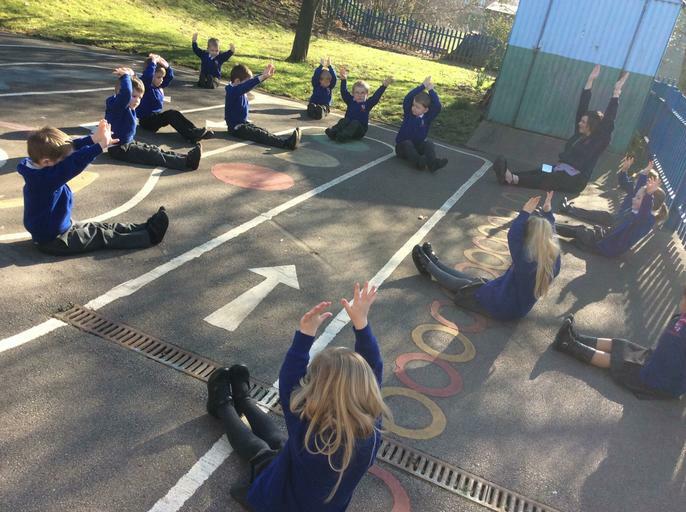 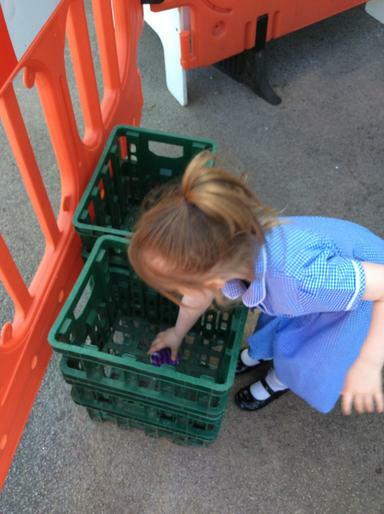 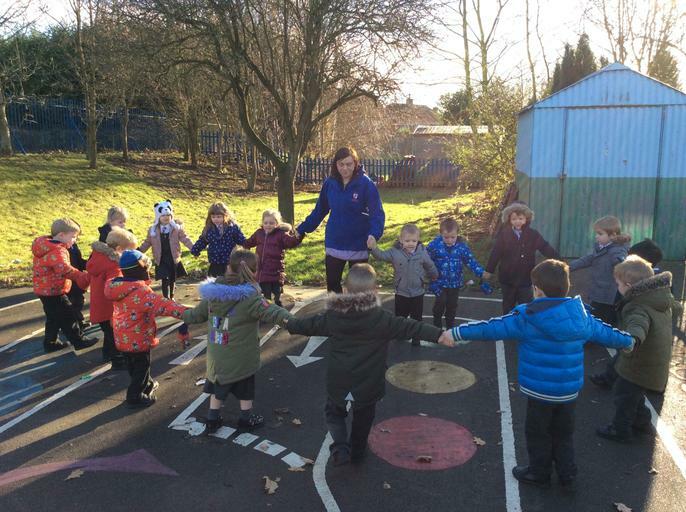 The children acted out incy wincy spider, played spider table football and explored insects outdoors. 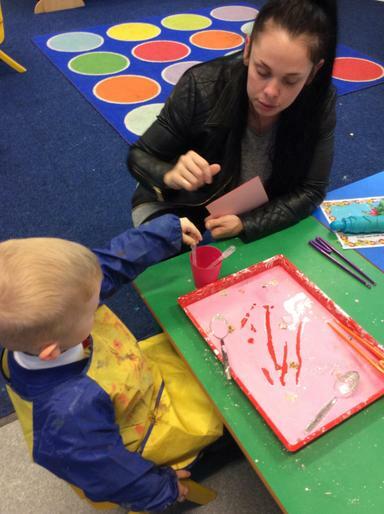 We loved having our Mothers to play for Mothers Day and had a great time at Birches Valley. 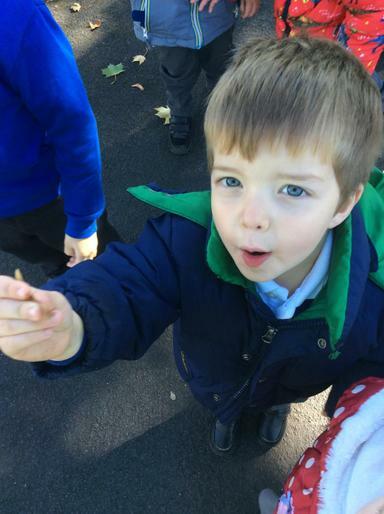 Week 25 - This week's story was Norman the slug with the silly shell. 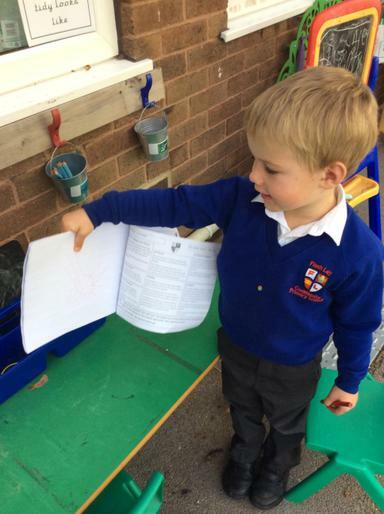 It's the start of our insect topic books. 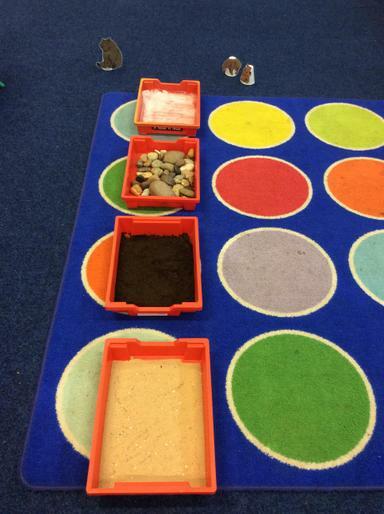 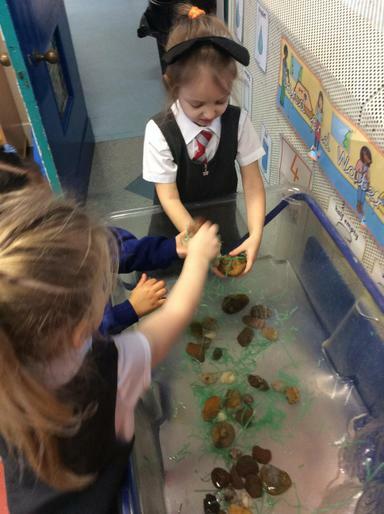 We investigated insects, experimented with different shells for Norman and enjoyed learning how to play stuck in the mud! 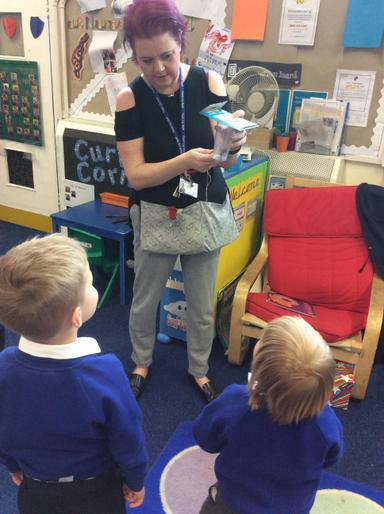 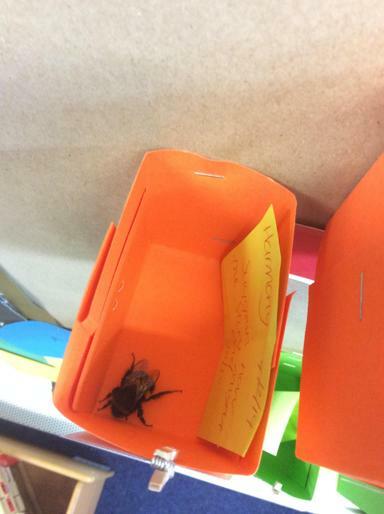 We even had a visit from a real life insect in the classroom, the bumblebee! 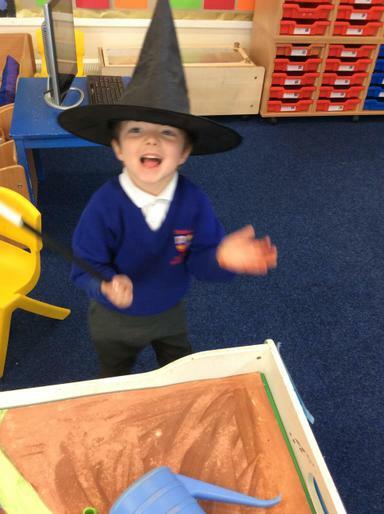 Week 24 - This week we looked at Hairy Maclary and his hat tricks! 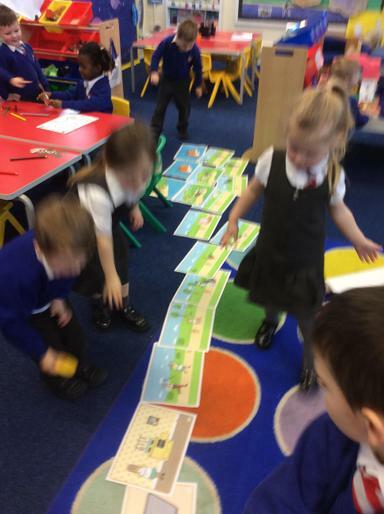 The weather was fitting to the story as the wind blew outside! 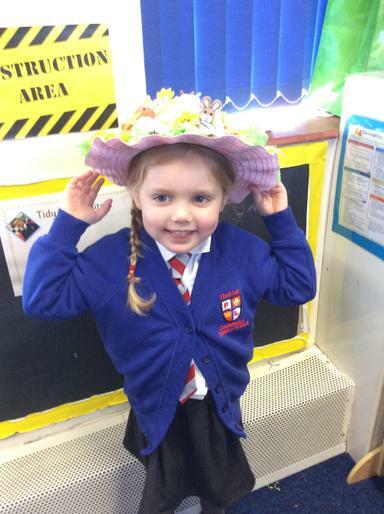 Hairy Maclary saved Grandmother Pugh's hat from blowing away! 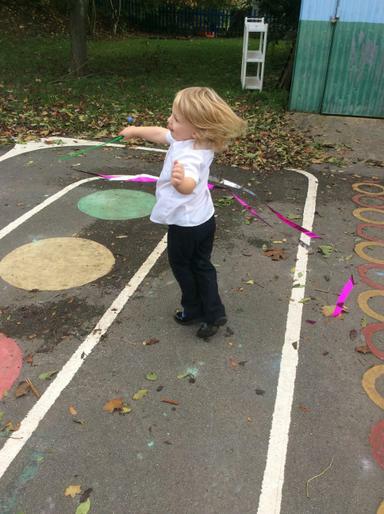 We nearly blew away during P.E! 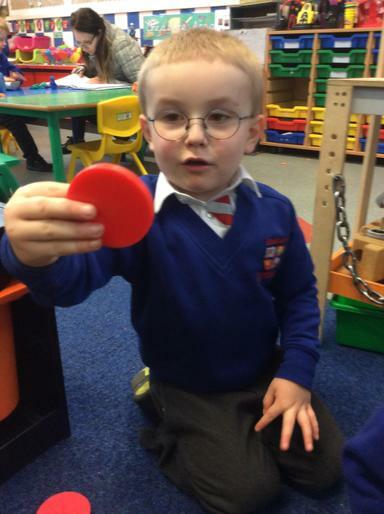 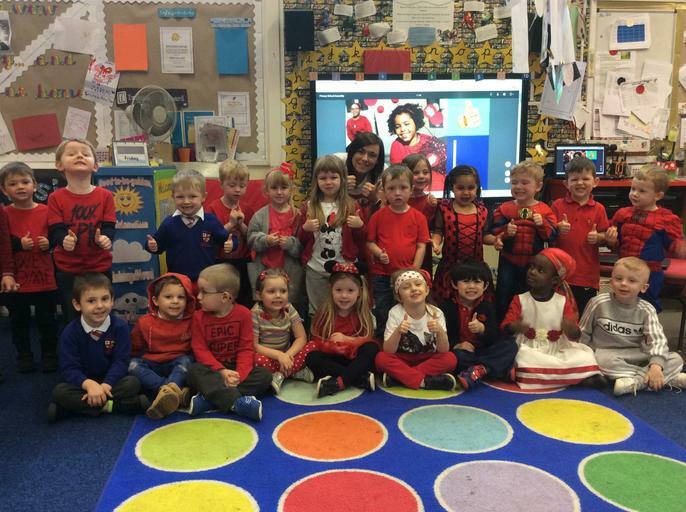 We enjoyed dressing in red for Red Nose Day too! 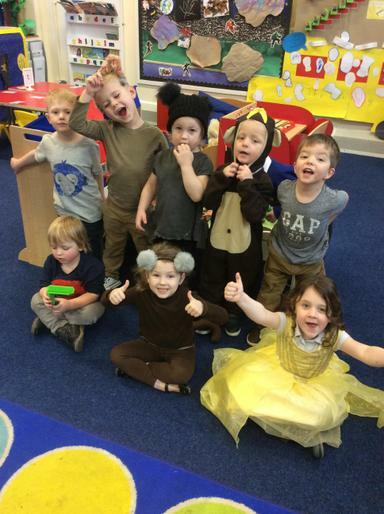 Week 23 - It's been a busy week this week with our second week focusing on a Midsummer Night's Dream. 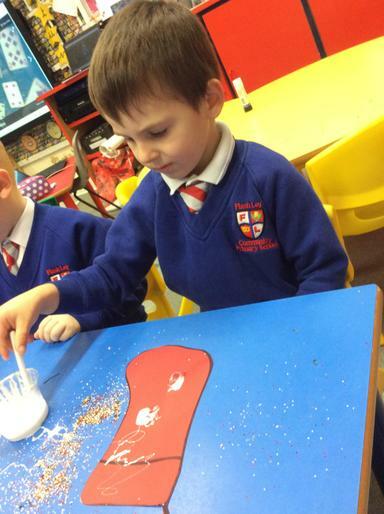 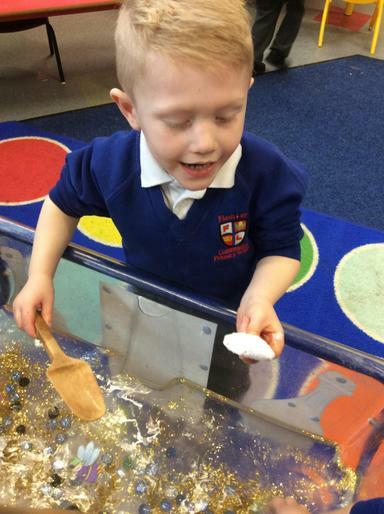 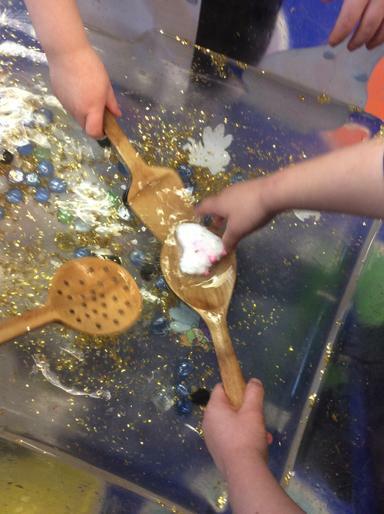 The children have explored fairy fizzers and made predictions about what will happen. 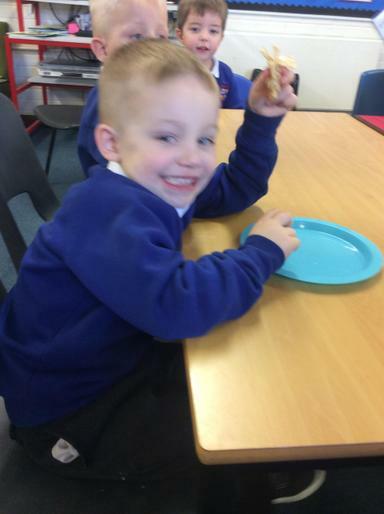 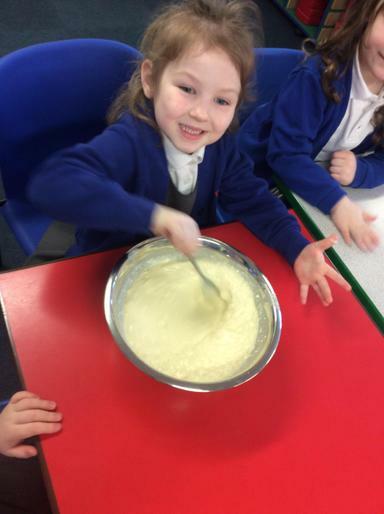 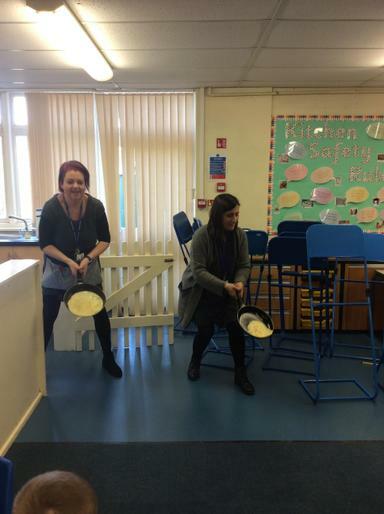 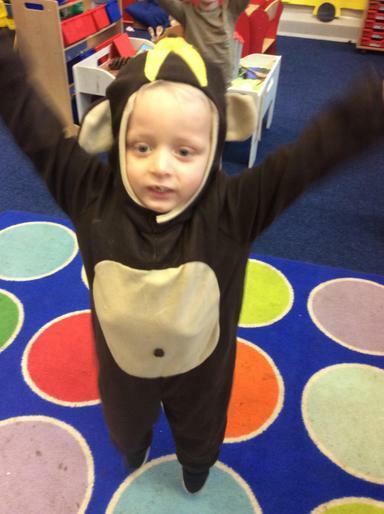 We enjoyed pancakes for Shrove Tuesday and dressed as Monkeys for World Book Day. 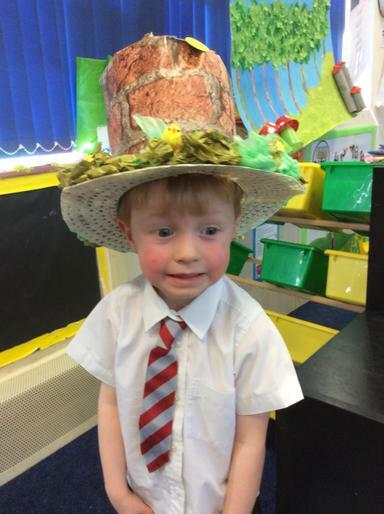 Week 22 - We have started our two week story focus on 'A Midsummer Night's Dream'. 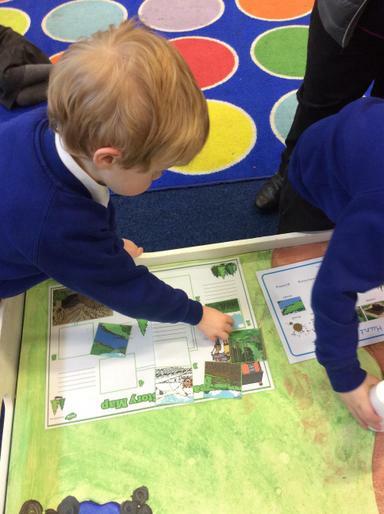 We looking at the fairy characters in the story and the magical forest setting. 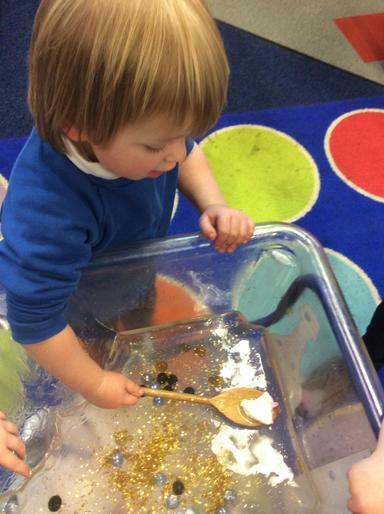 The children have been describing fairies, talking about magical powers, creating potions and building fairy gardens and castles. 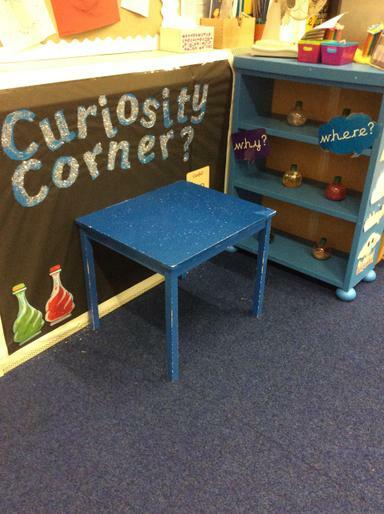 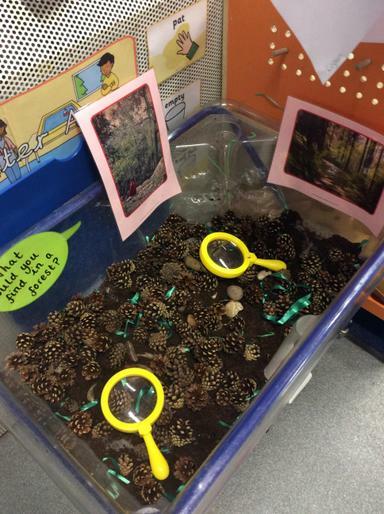 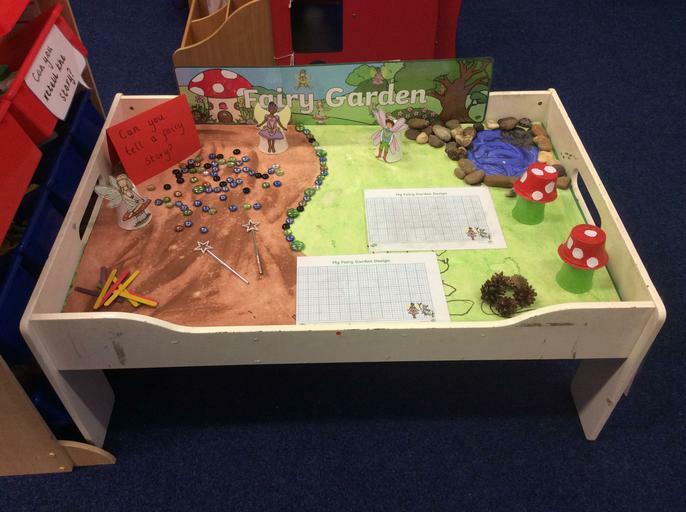 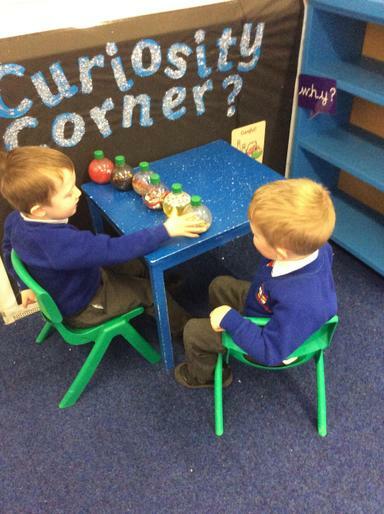 We have a new curiosity corner to explore curious objects. 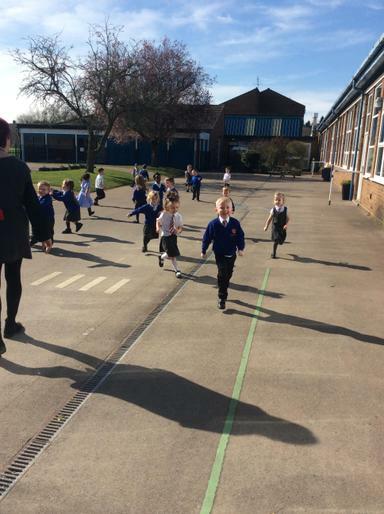 Week 21 - Run, run as fast as you can, you can't catch me I'm the gingerbread man! 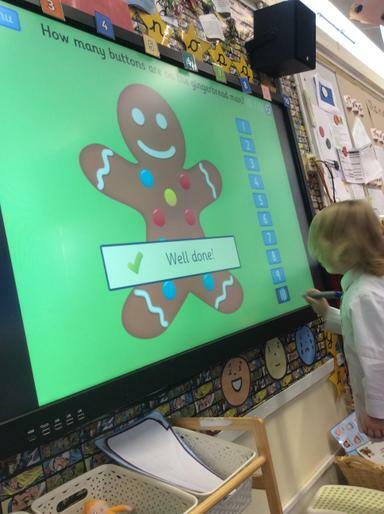 This week we have explored the story The Gingerbread Man. 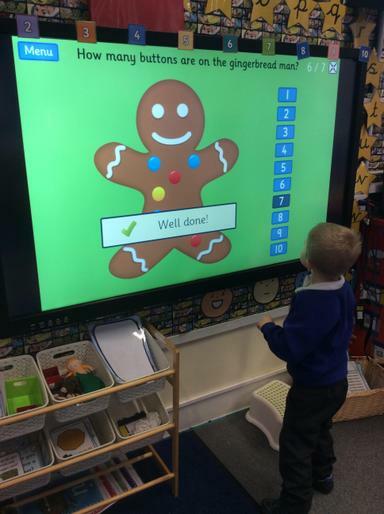 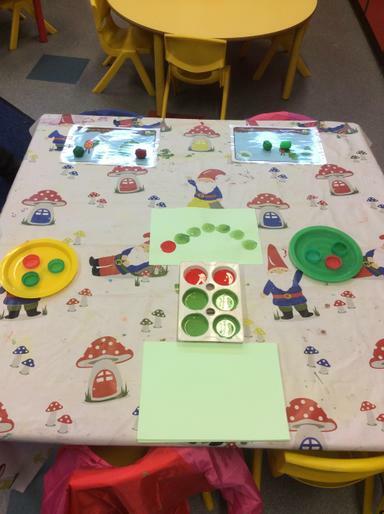 The children counted buttons on Gingerbread men, designed their own faces and acted out the story! 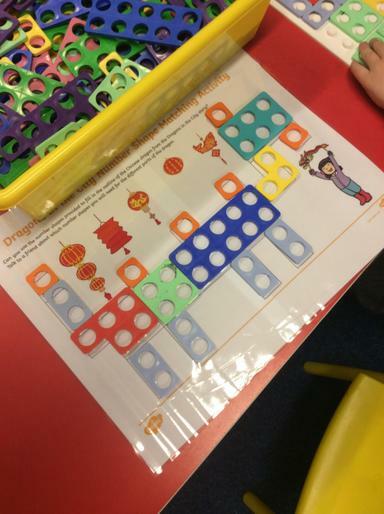 Week 20 - Kung Hei Fat Choi, which is Happy New Year in Chinese. 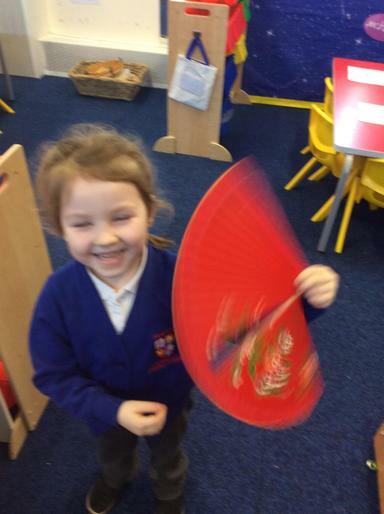 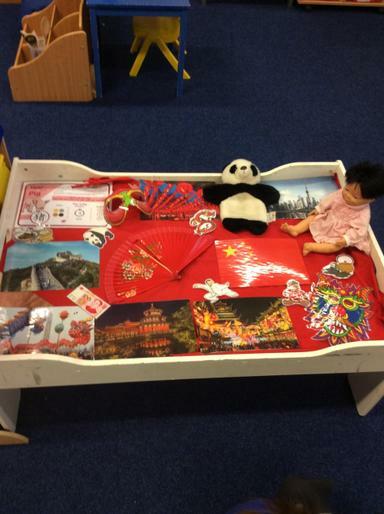 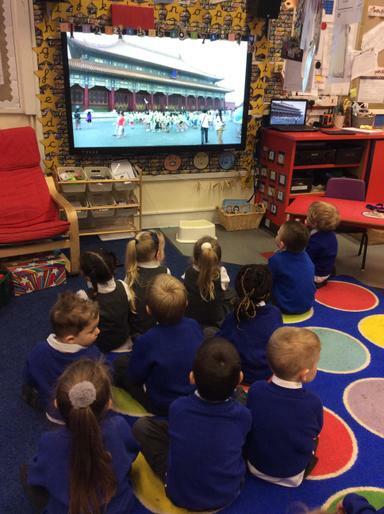 We are learning about Chinese New Year this week and all about the country China. 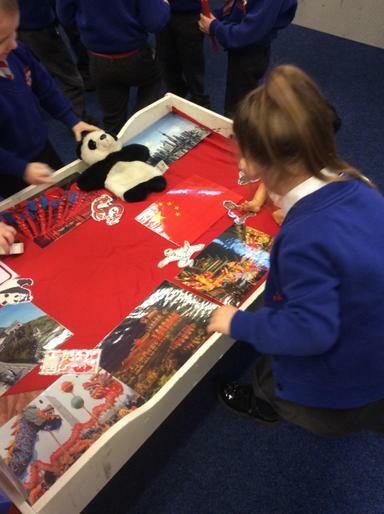 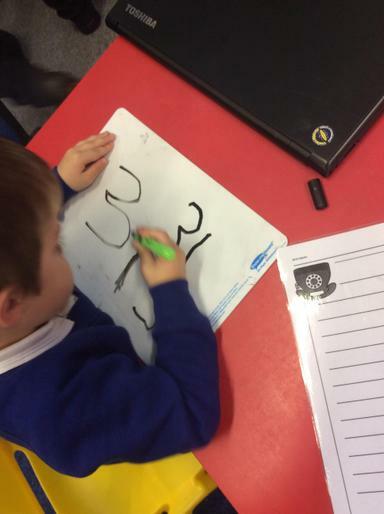 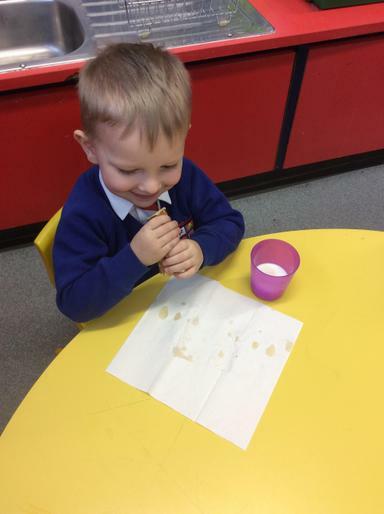 We enjoyed tasting Chinese snacks, writing Chinese numerals and the story 'The Magic Paintbrush'. 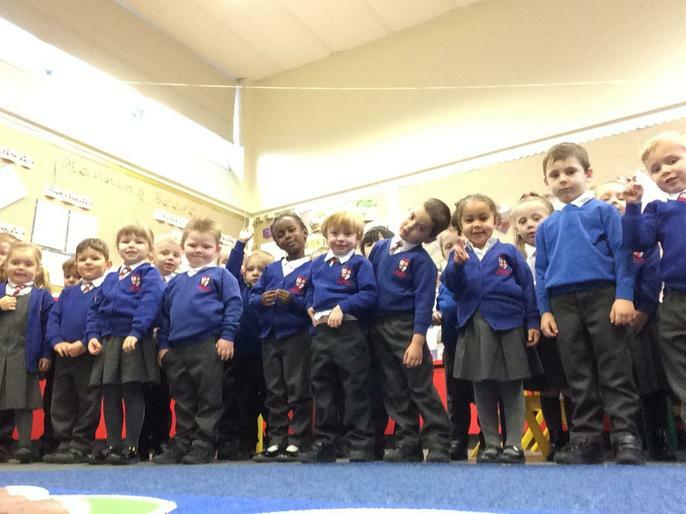 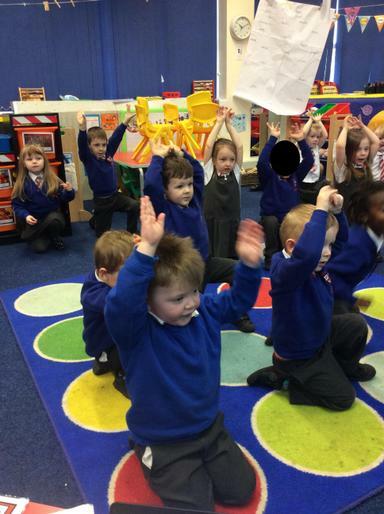 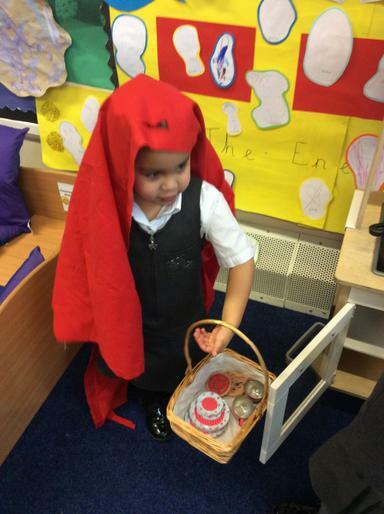 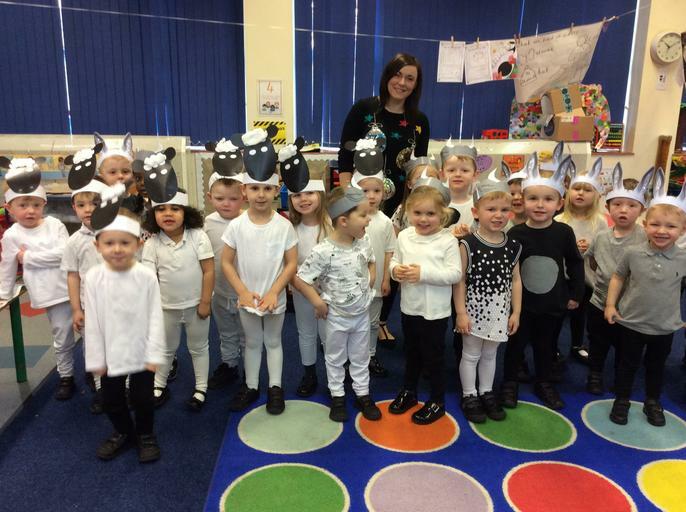 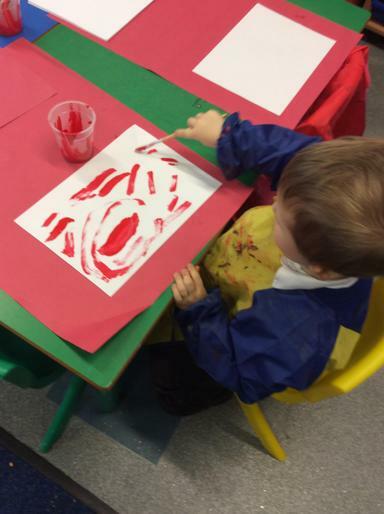 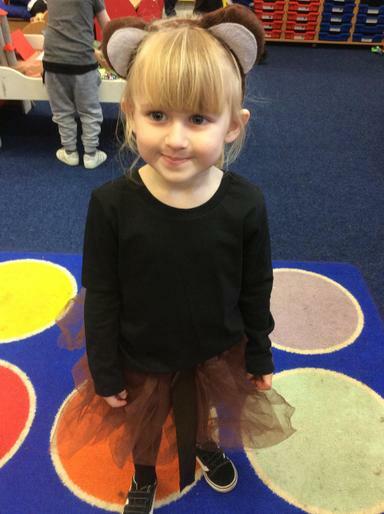 Week 19 - Our story this week is Little Red Riding Hood! 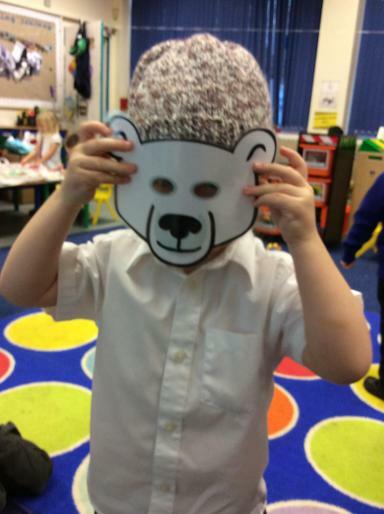 What a mean character the Big Bad Wolf is! 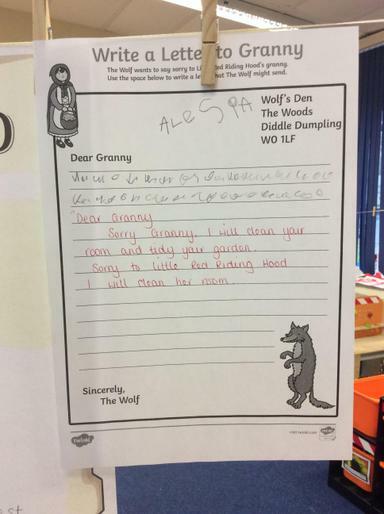 We have written letters to Granny to say sorry for his unkind behaviour and talked about the dangers of strangers! 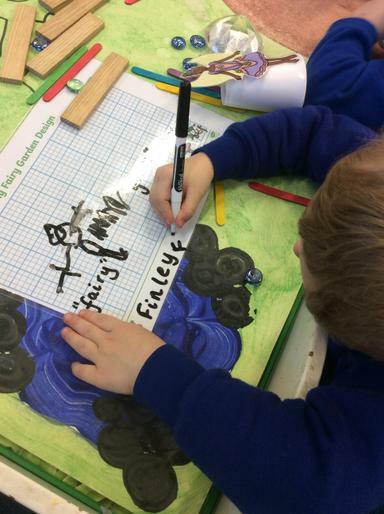 The children enjoyed acting out the story, drawing wanted posters to warn everyone about the wolf and exploring a forest environment. 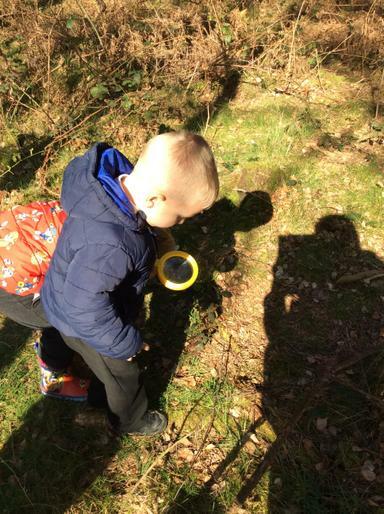 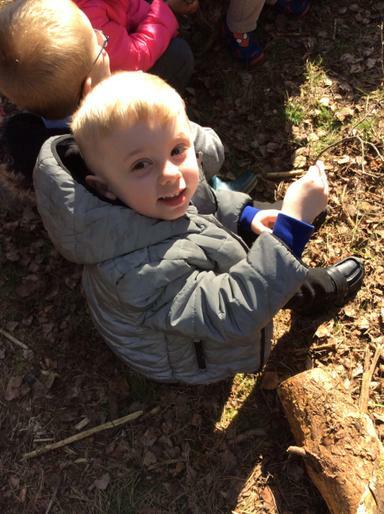 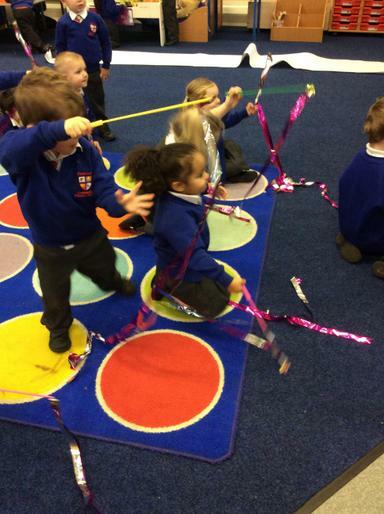 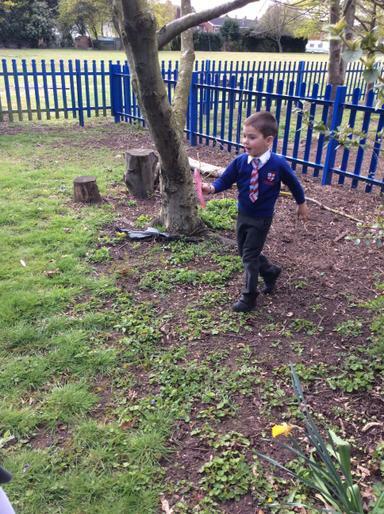 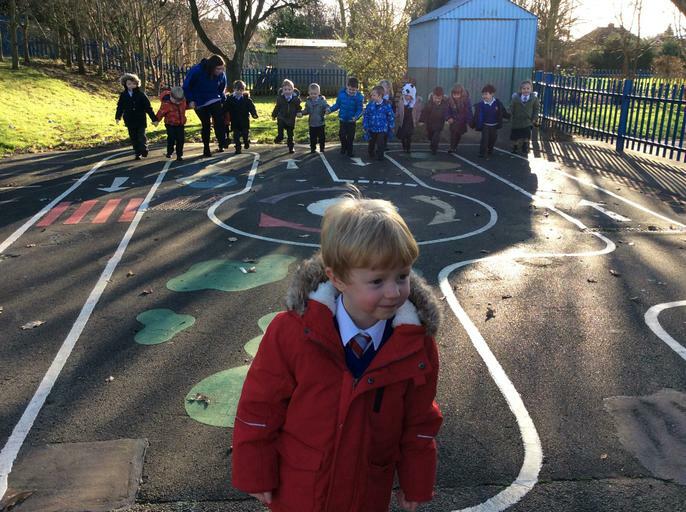 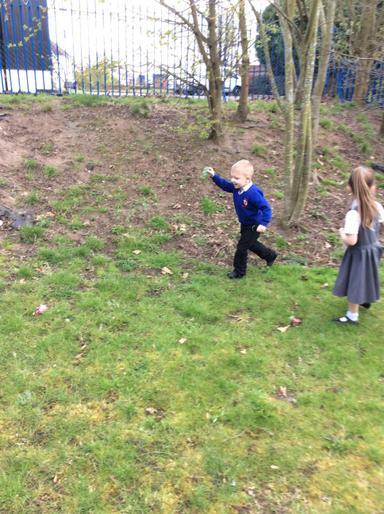 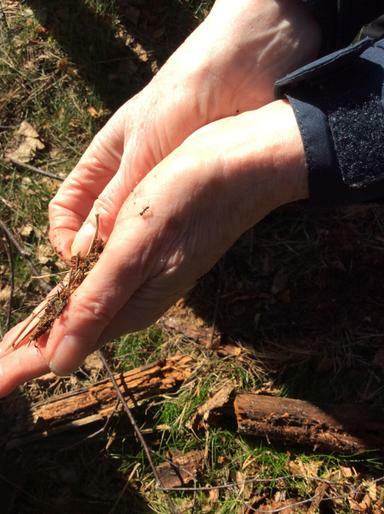 Week 18 - We're going on a bear hunt, we're going to catch a big one! 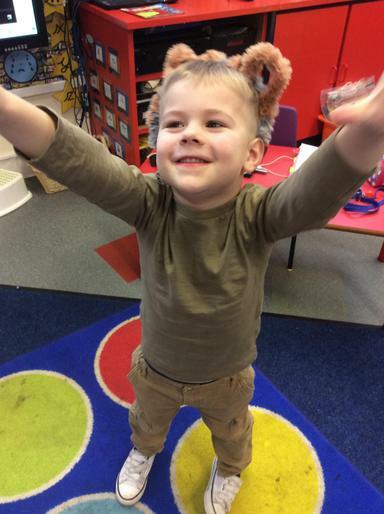 This week we have been hunting bears everywhere! 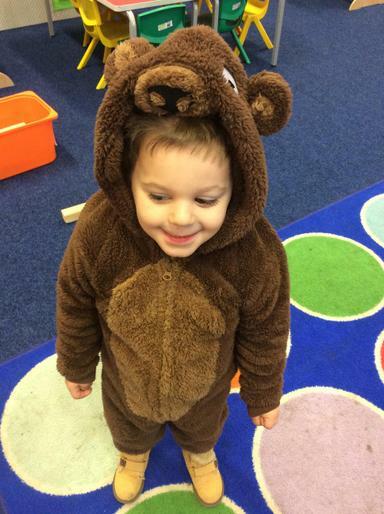 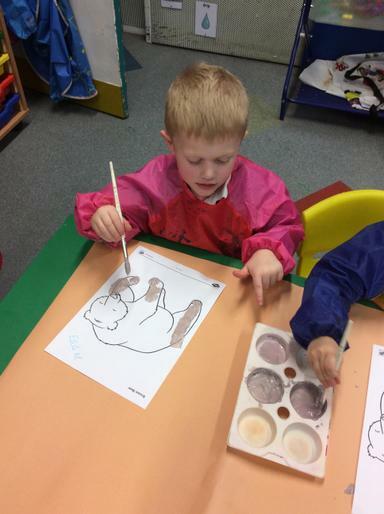 The children have painted bears, sorted bears by size, built bear caves and enjoyed acting out the bear hunt story! 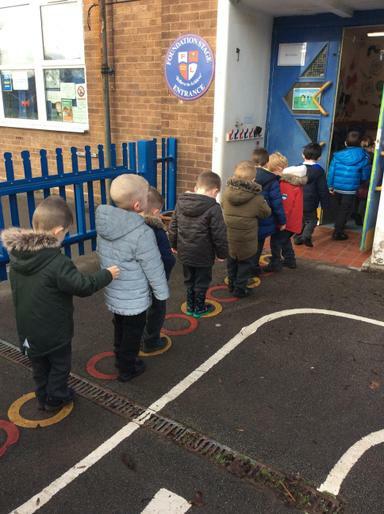 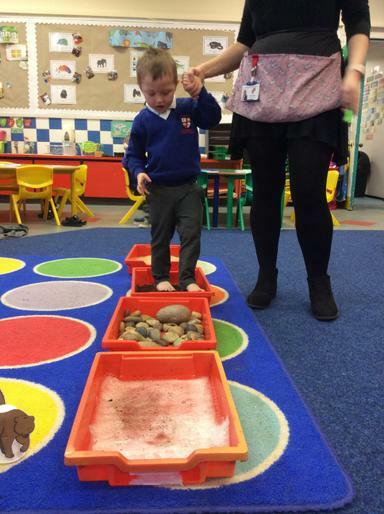 We enjoyed a bare footed walk through all different textures and practised putting on our own shoes and socks afterwards! 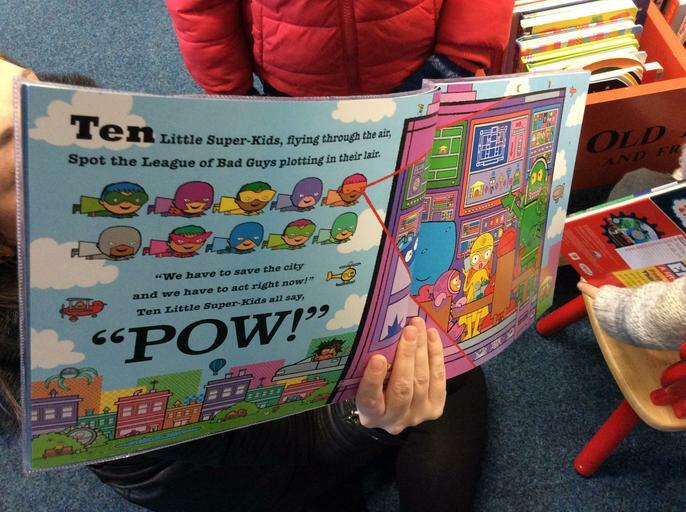 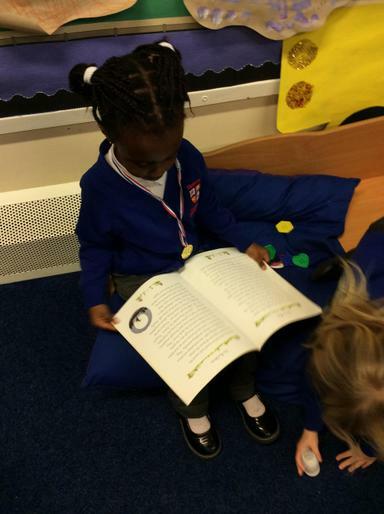 Week 17 - Our story this week is Charlie Cook's favourite book! 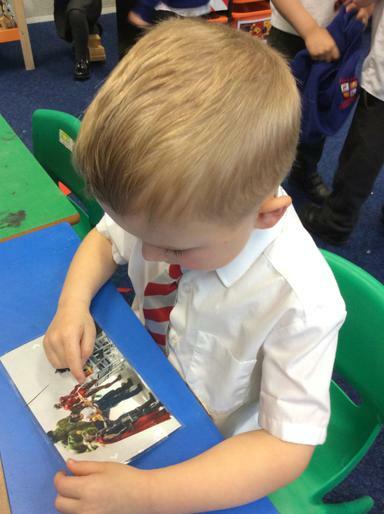 There was so many characters and settings to explore as each page told us about a different story. 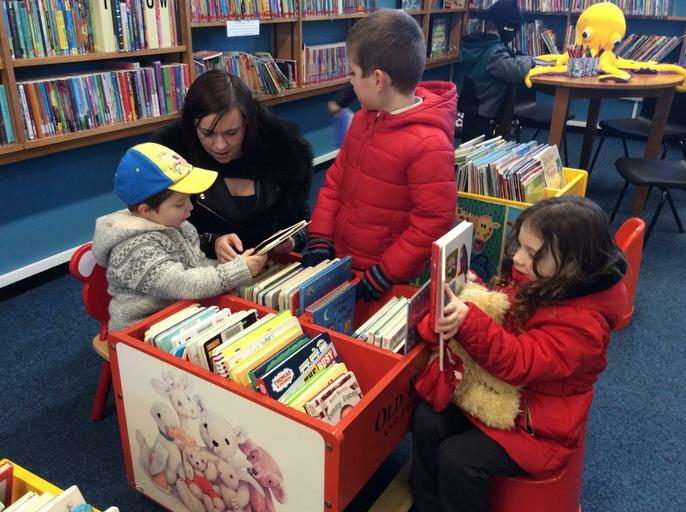 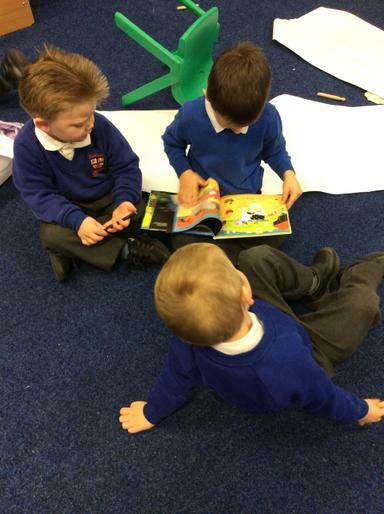 We shared our own favourite stories, explored different genres and visited the local library. 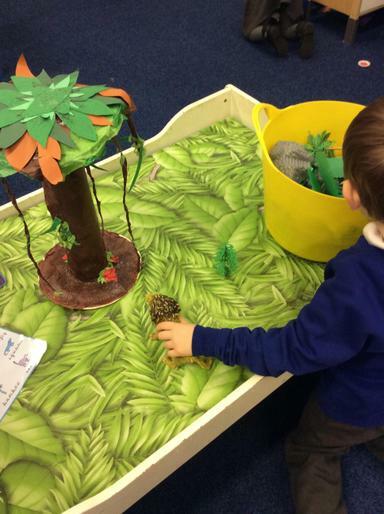 Week 16 - The children enjoyed a jungle theme this week as we introduced our characteristics of effective learning characters. 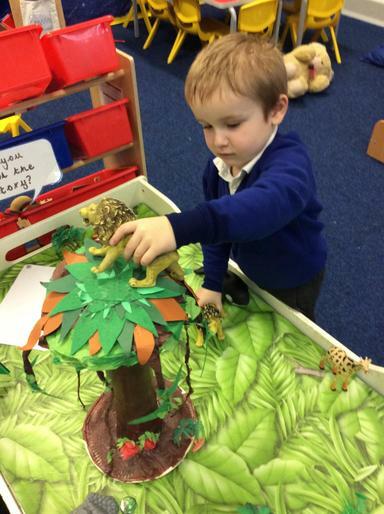 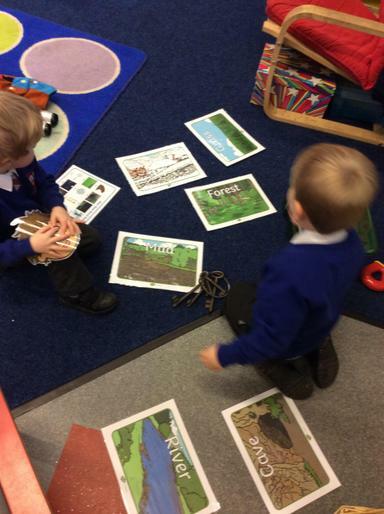 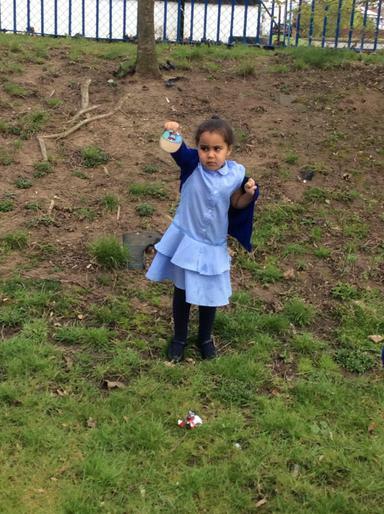 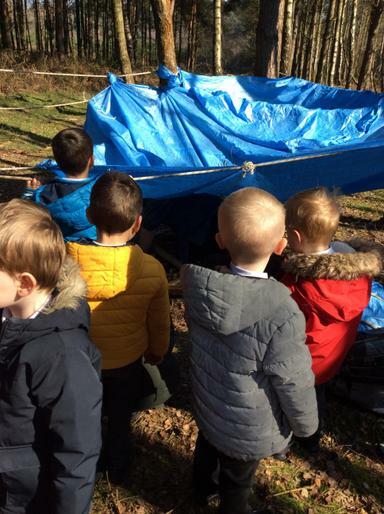 The children explored animal ring games, building jungle huts and the story walking through the jungle! 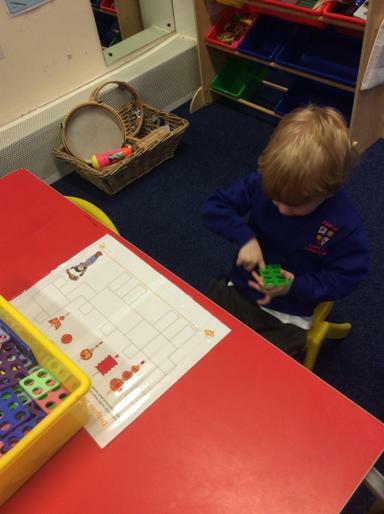 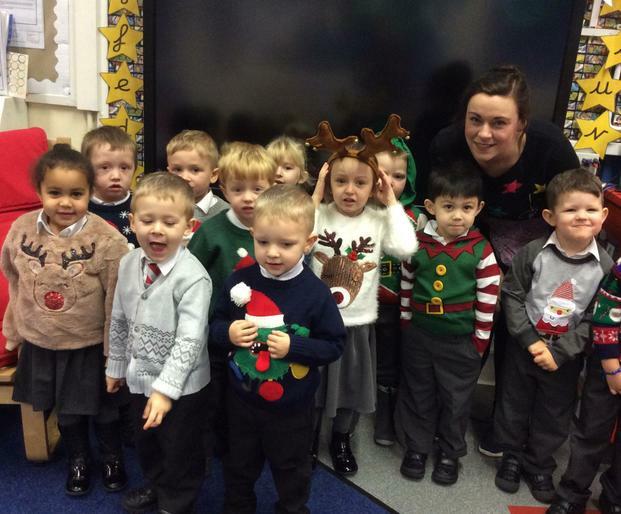 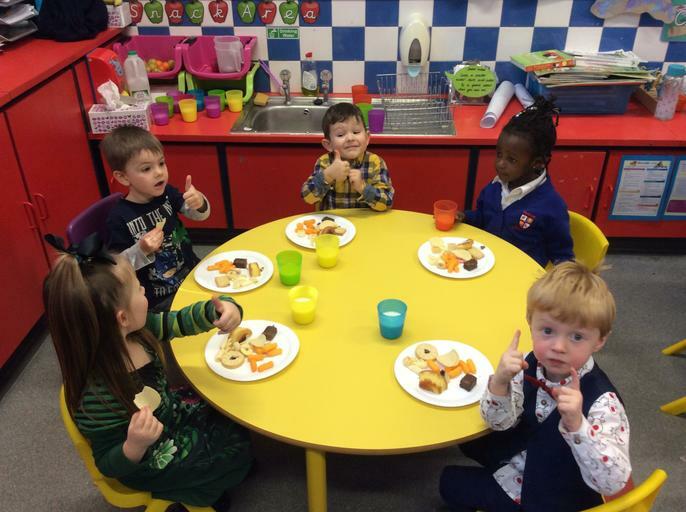 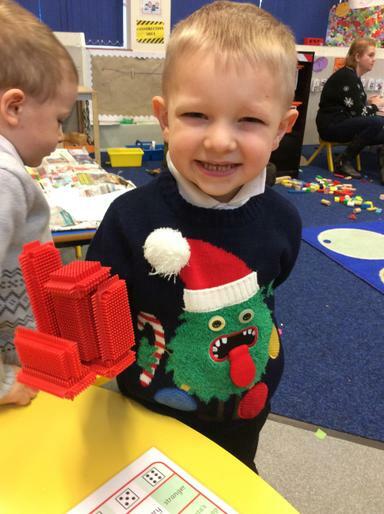 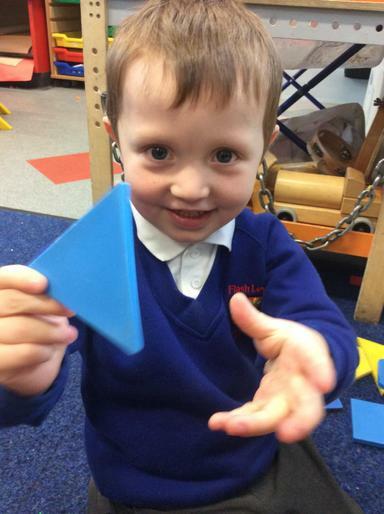 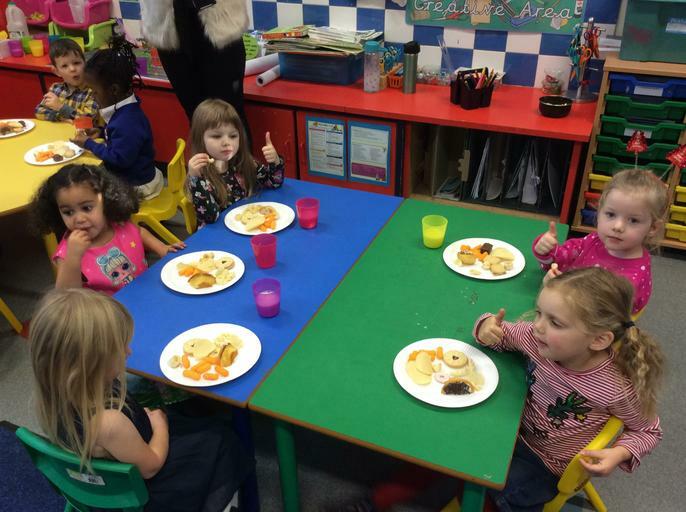 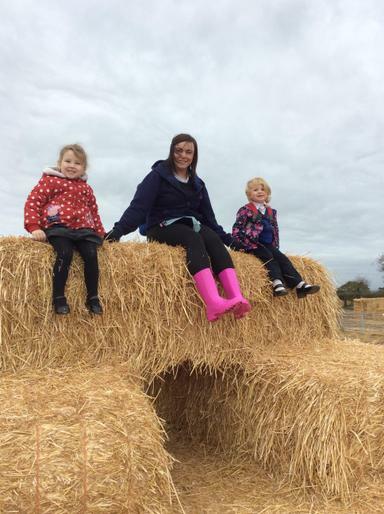 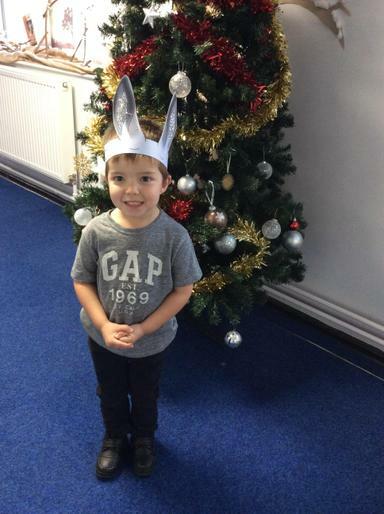 Week 15 - What a festive week we have had! 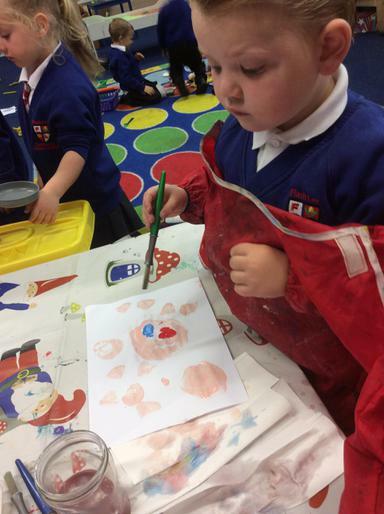 We have made decorations, calendars and enjoyed a End of year party!! 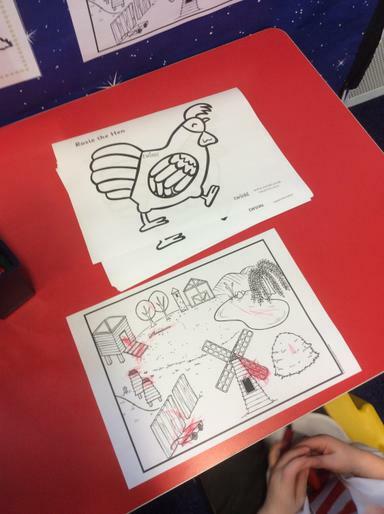 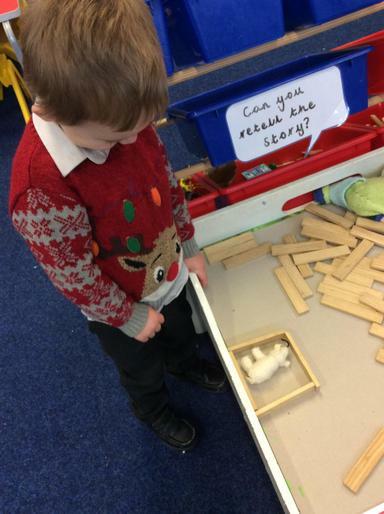 Week 14 - This week we have explored the Christmas story, performed an amazing Nativity and written our own Christmas stories! 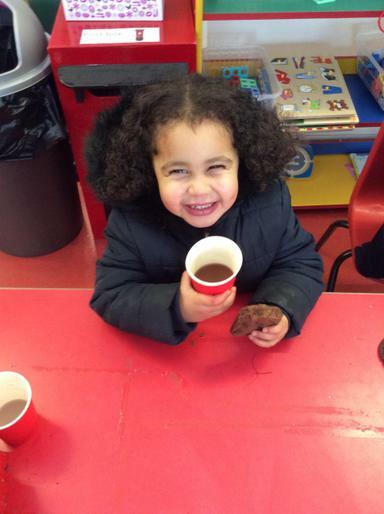 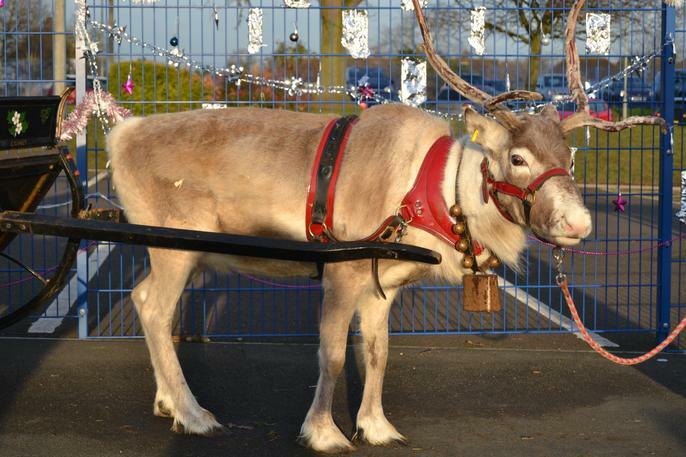 Winter Wonderland was especially wow as the children met Santa, his reindeer and enjoyed yummy hot chocolate and cookies! 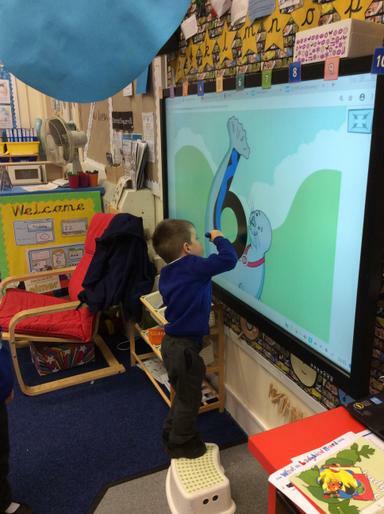 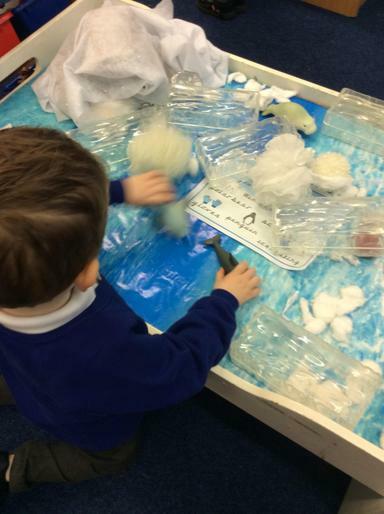 Week 13 - This week we explored Winter with the story Betty and the Yeti. 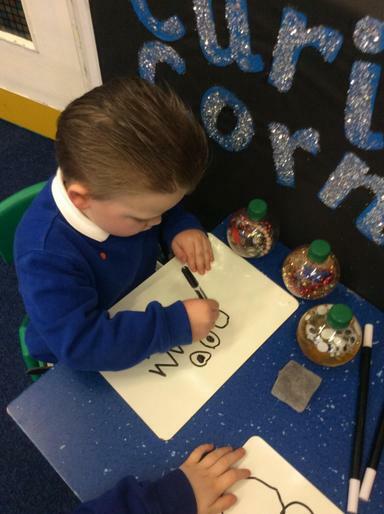 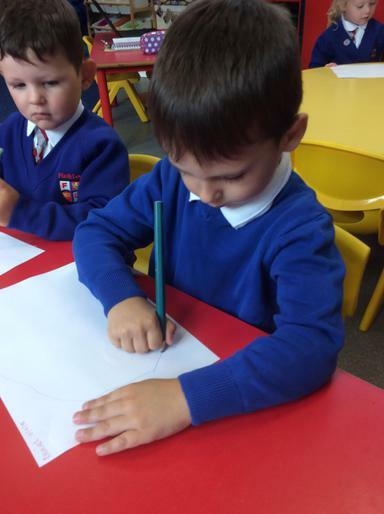 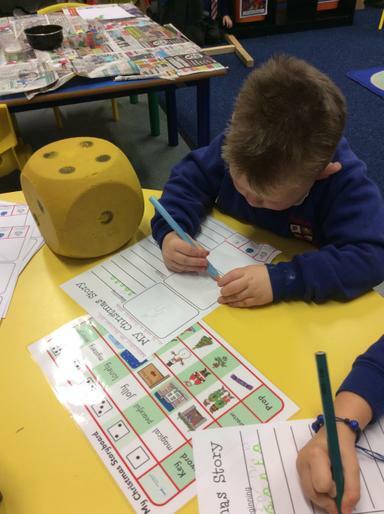 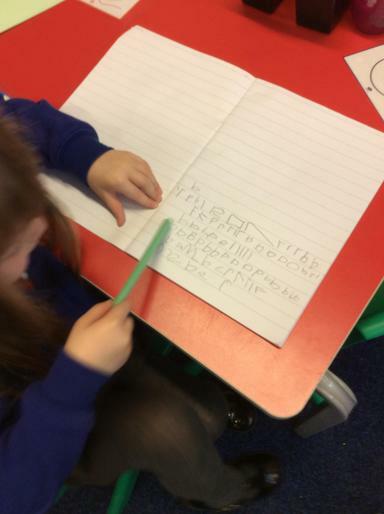 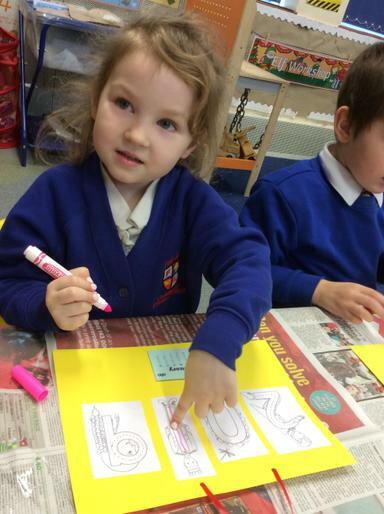 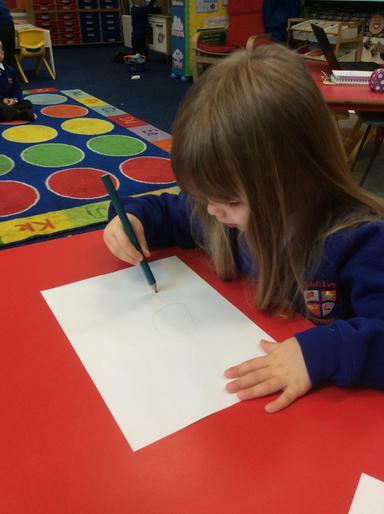 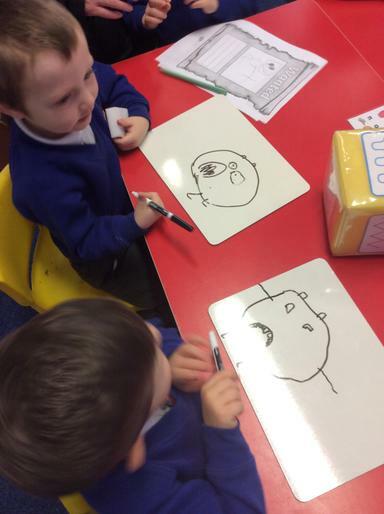 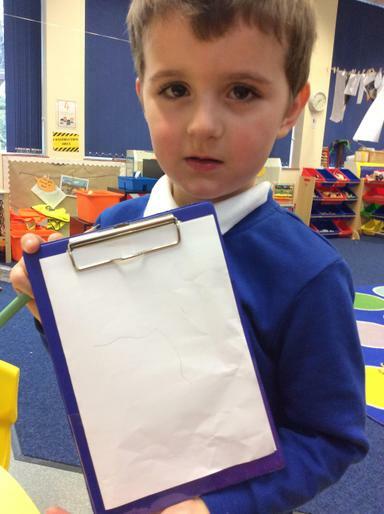 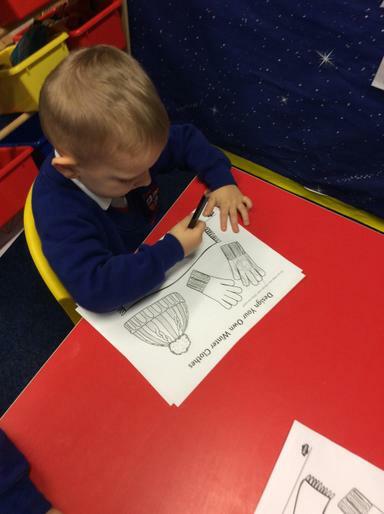 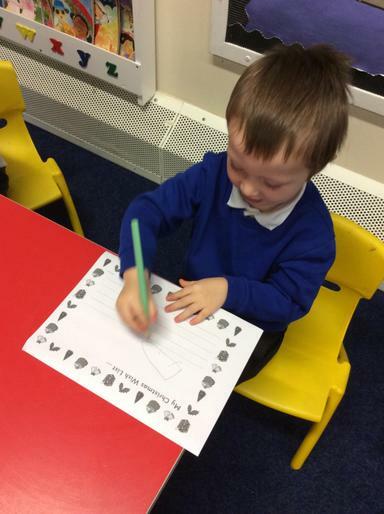 We used describing words to draw our own missing yeti posters. 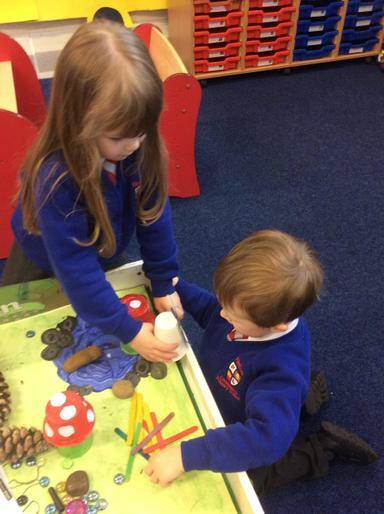 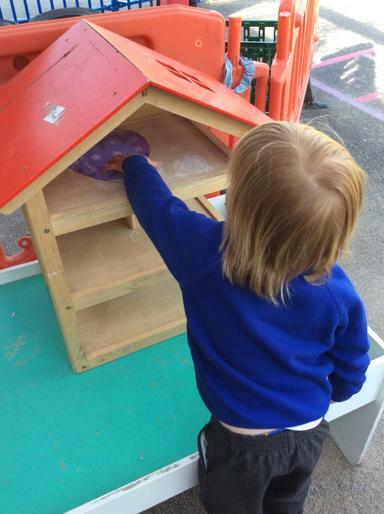 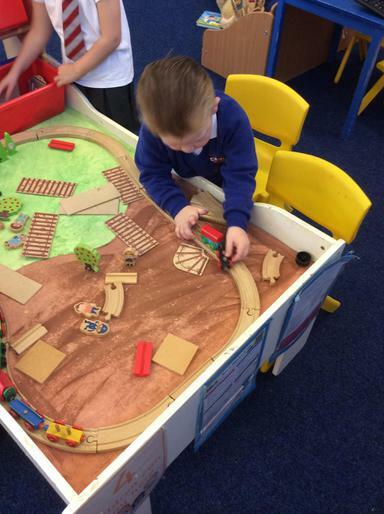 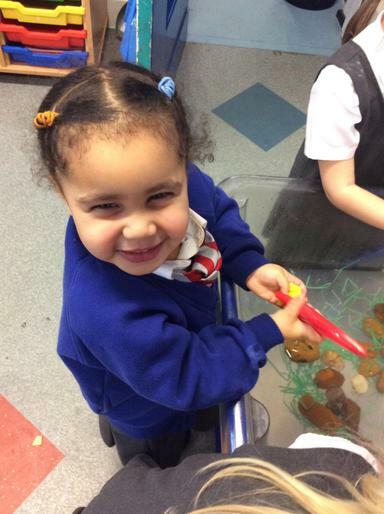 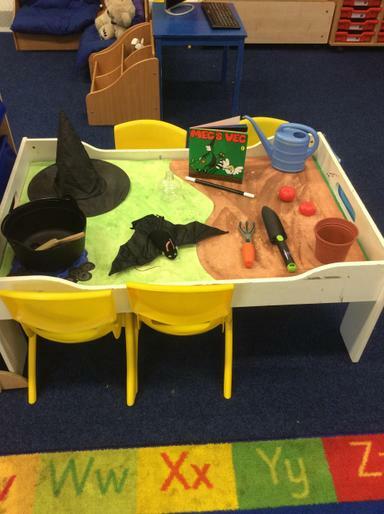 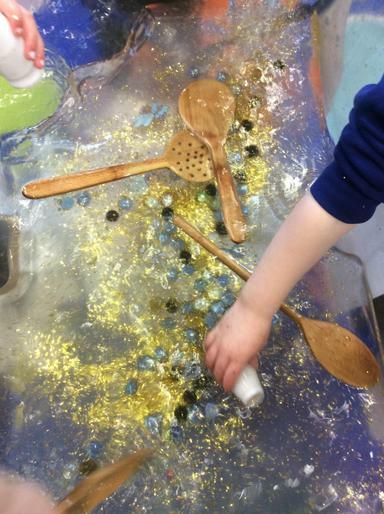 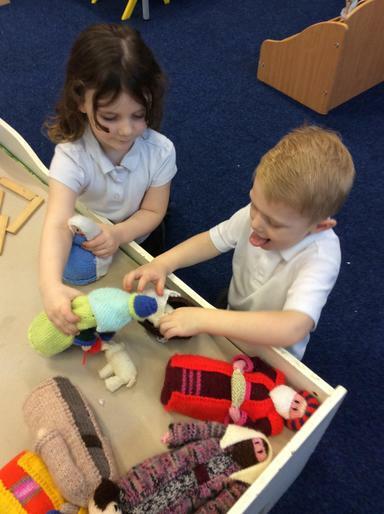 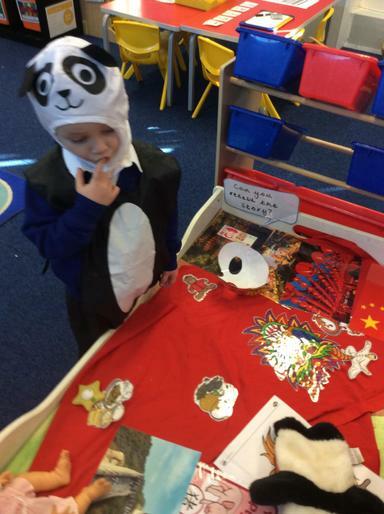 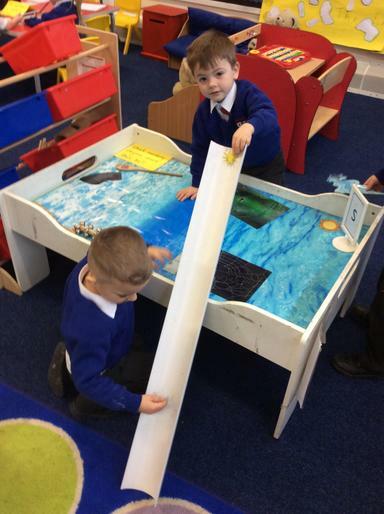 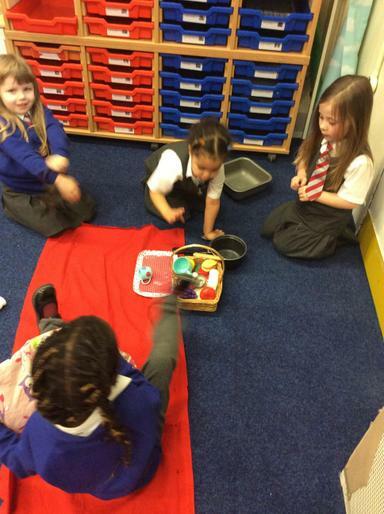 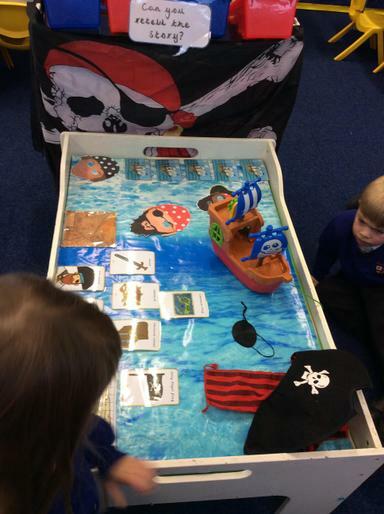 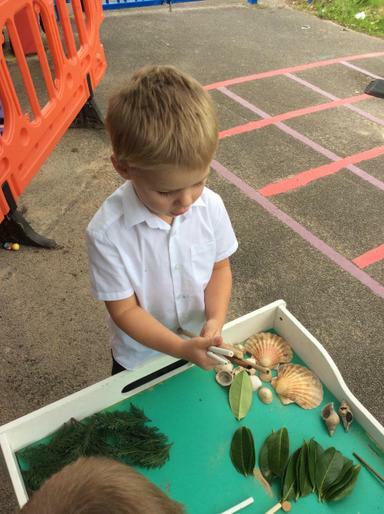 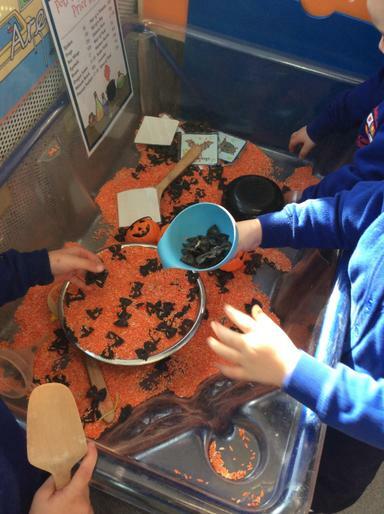 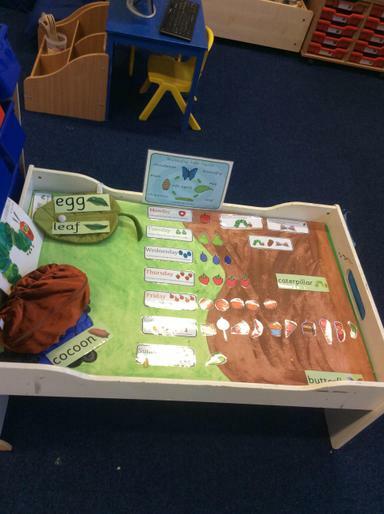 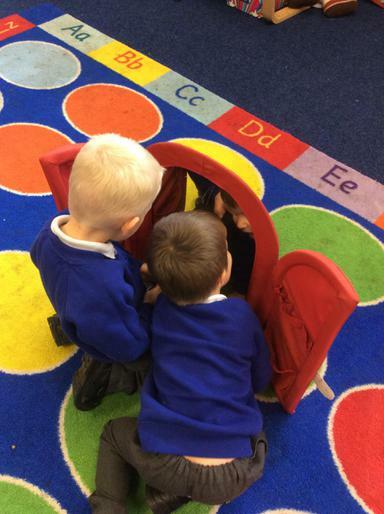 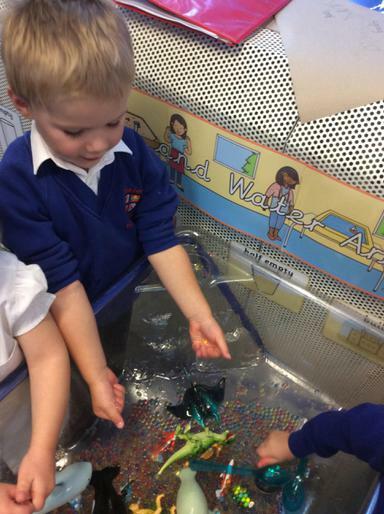 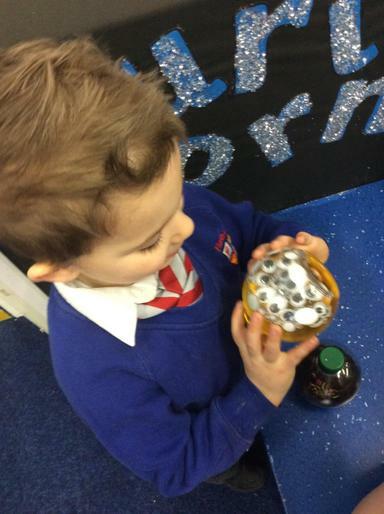 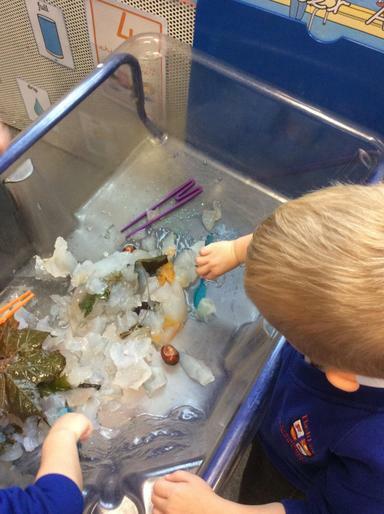 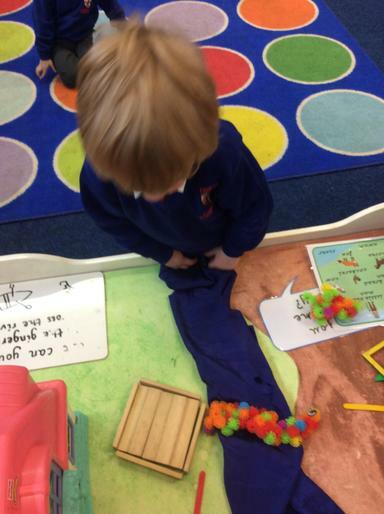 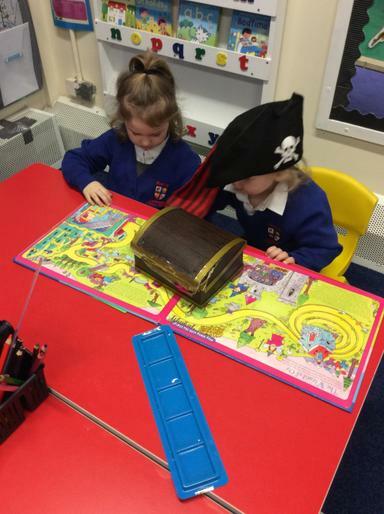 The children enjoyed the prop box to act out the story and a winter sensory table. 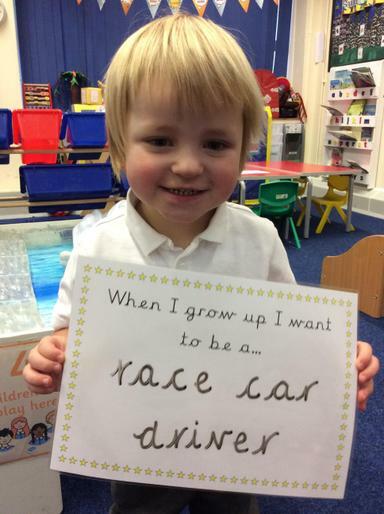 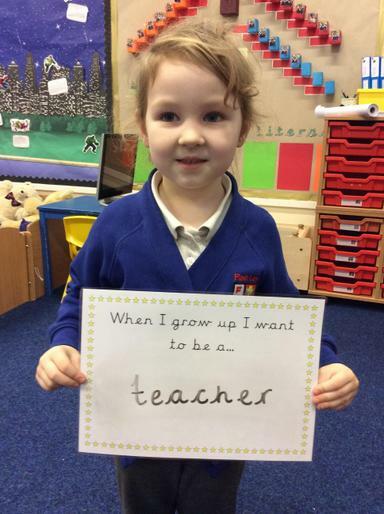 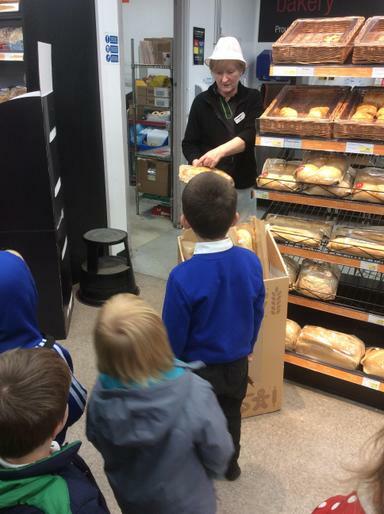 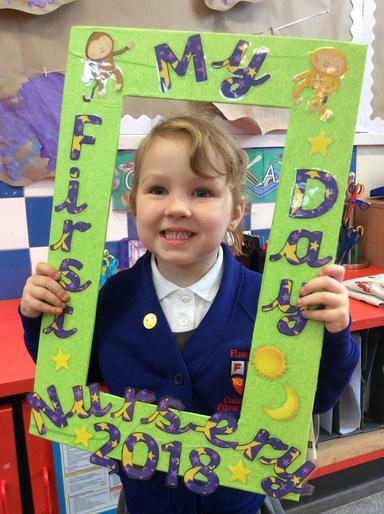 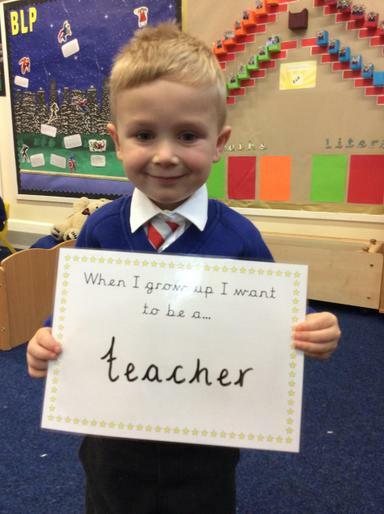 Week 12 - For aspiration day we looked at different occupations and talked about our aspirations for the future. 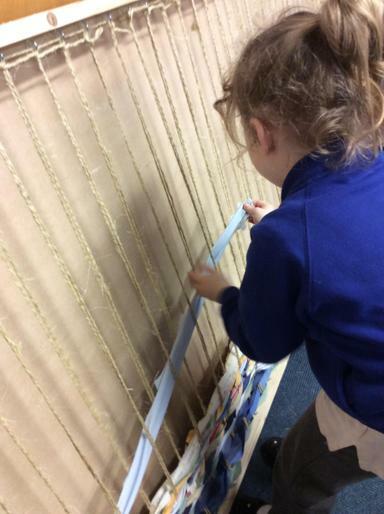 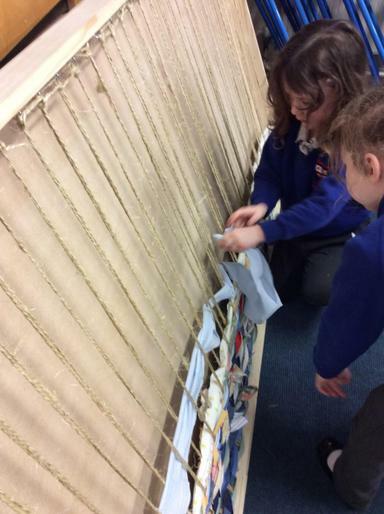 The children contributed to a whole school art piece involving materials and weaving. 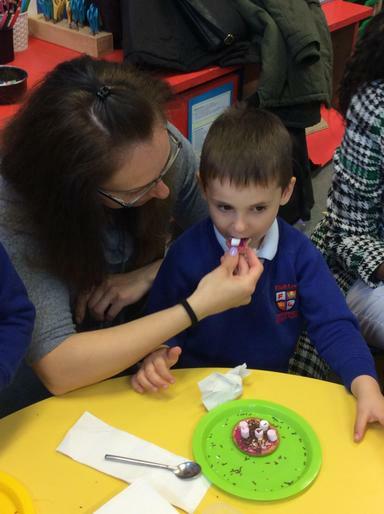 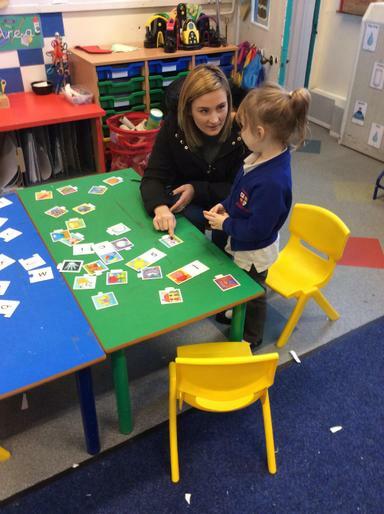 We also enjoyed some fabulous phonics with Parents & Carers! 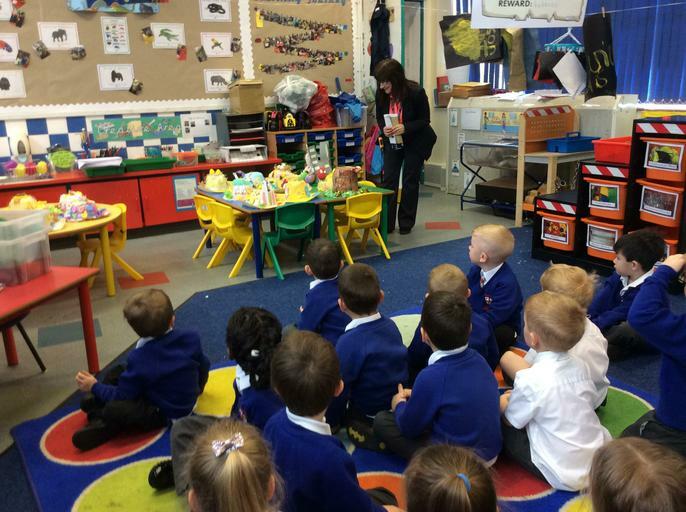 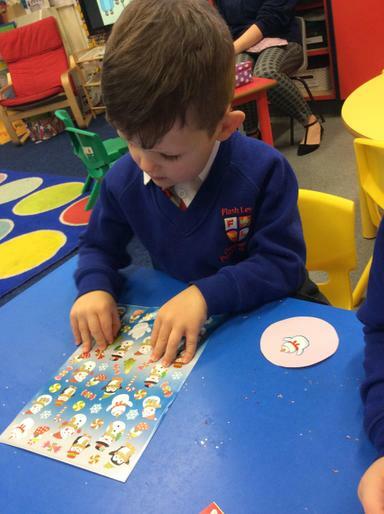 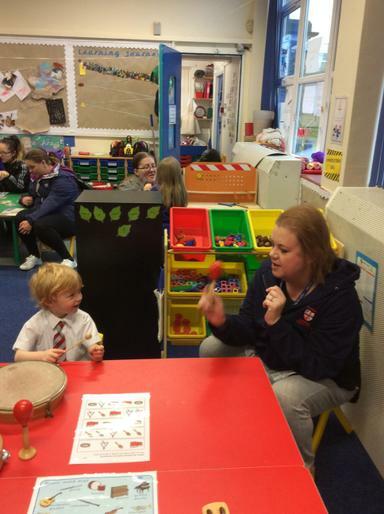 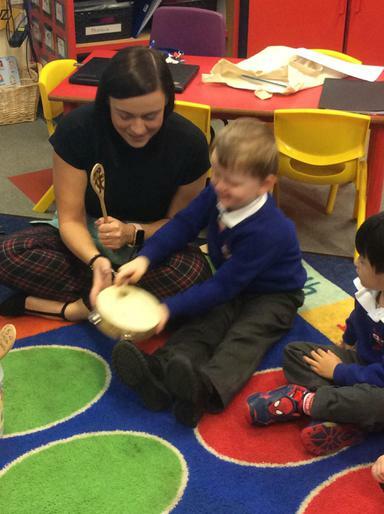 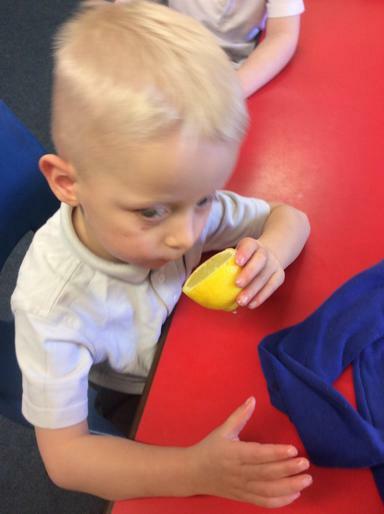 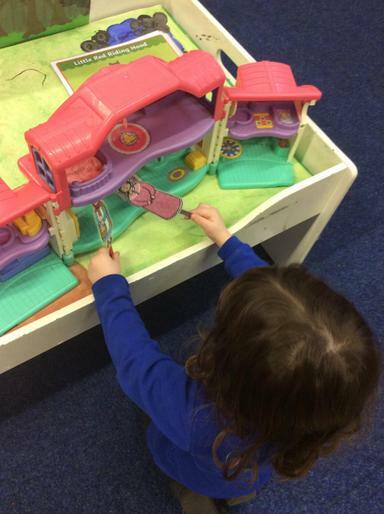 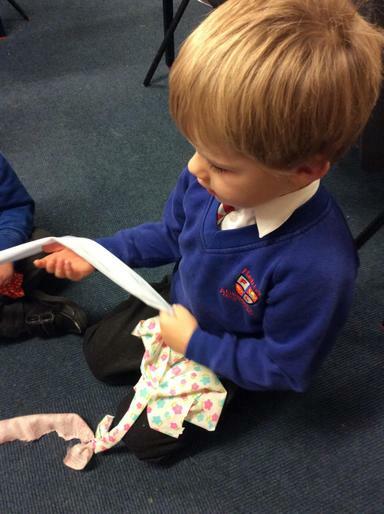 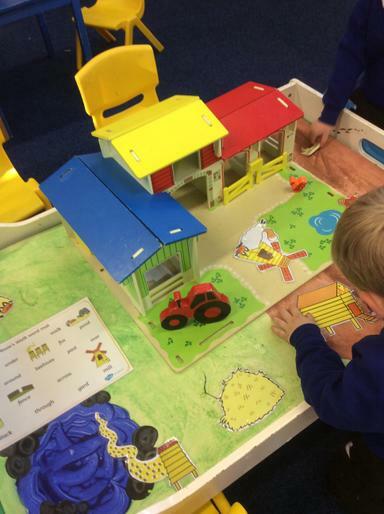 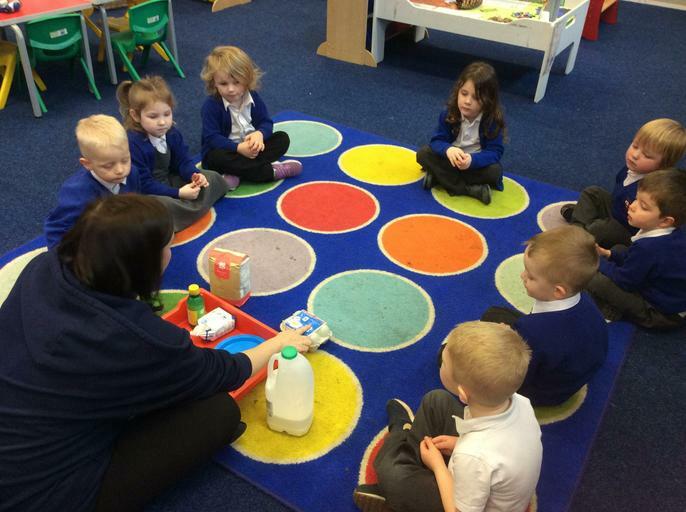 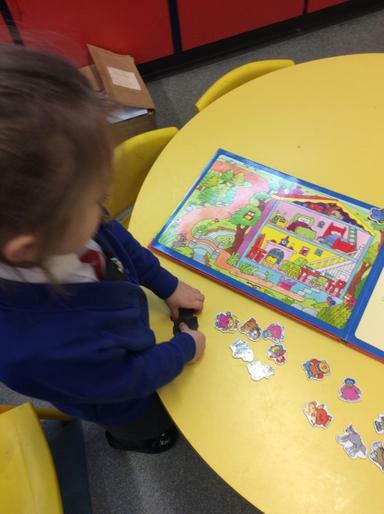 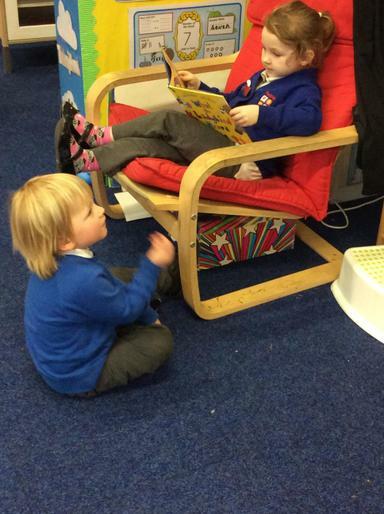 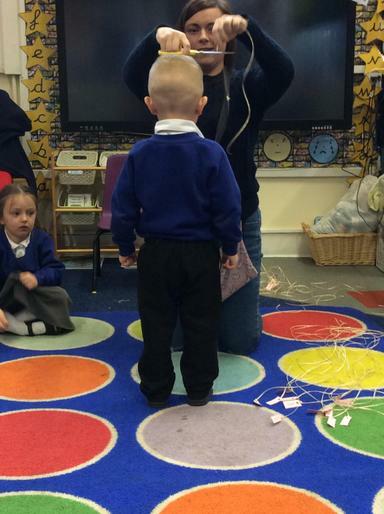 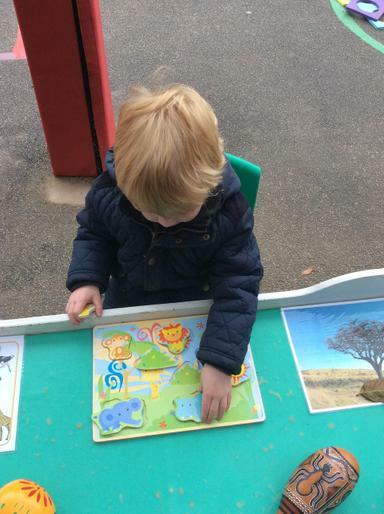 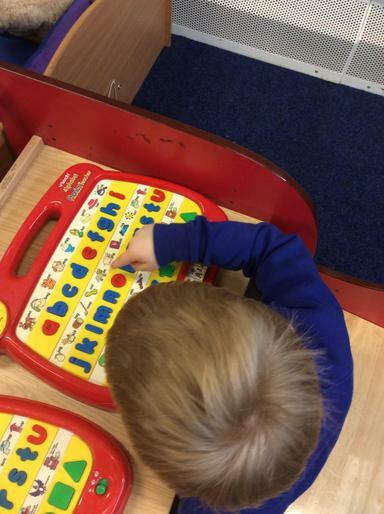 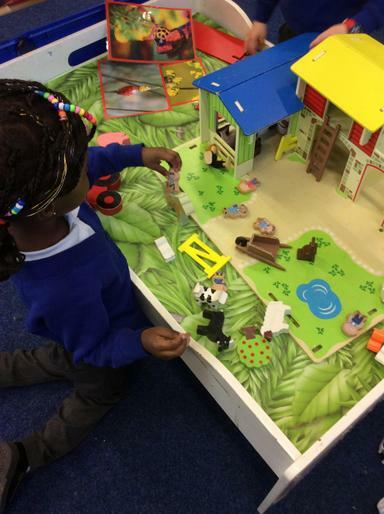 Week 11 - This week we enjoyed the story 'What the ladybird heard'. 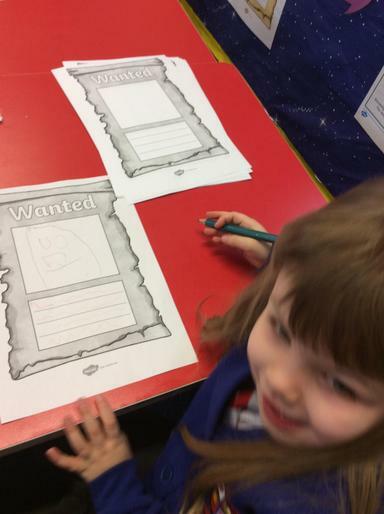 The children drew fantastic wanted posters describing the characters of the thieves. 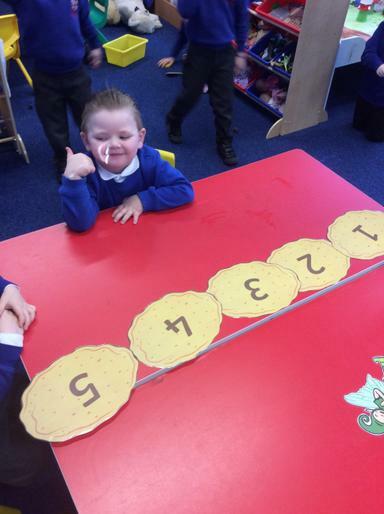 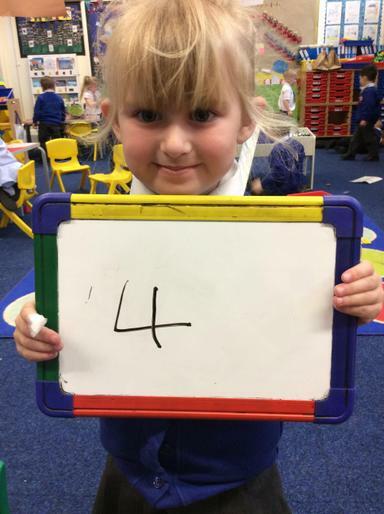 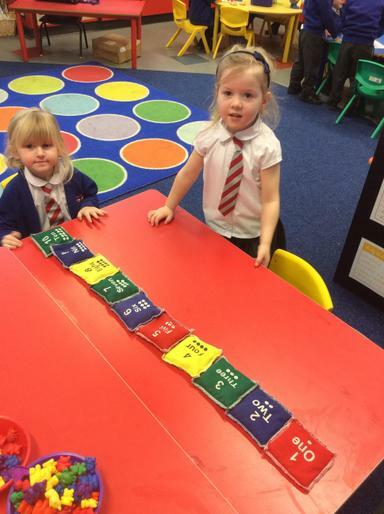 We explored the number 7 this week and have seen some brilliant numerals formed by all the children! 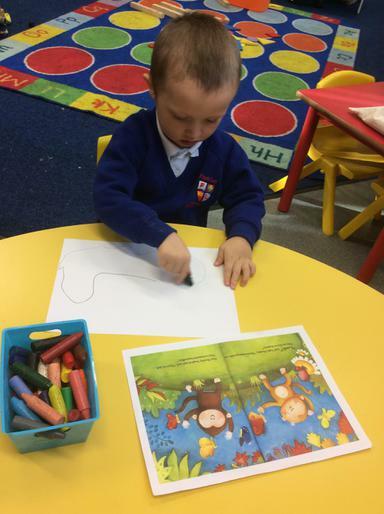 Week 10 - Our story this week was Elmer. 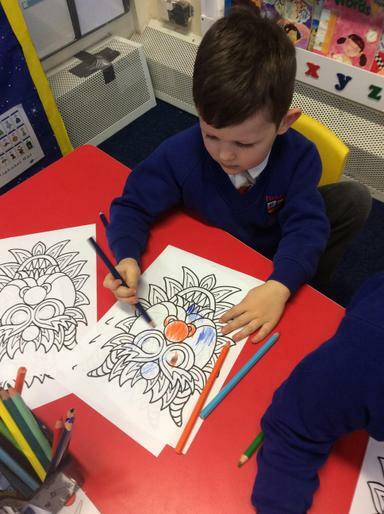 We looked at the colours, feelings and patterns from the story. 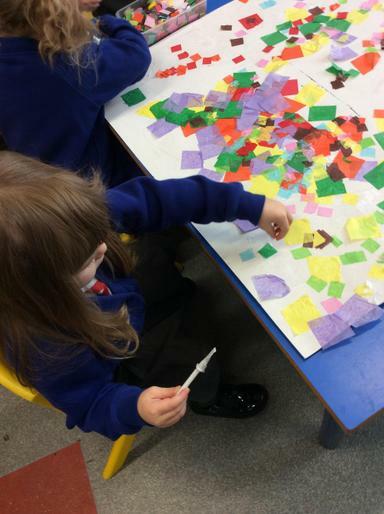 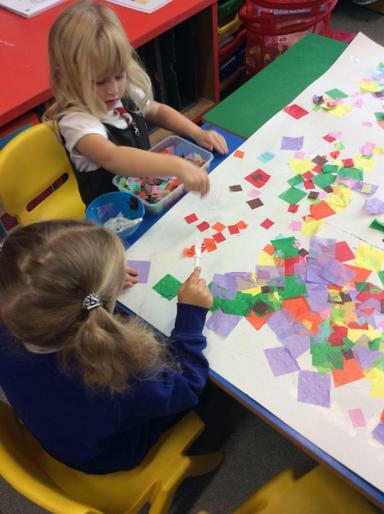 The children enjoyed working together to create a huge Elmer collage, exploring feelings from the story and making milk bottle elephants. 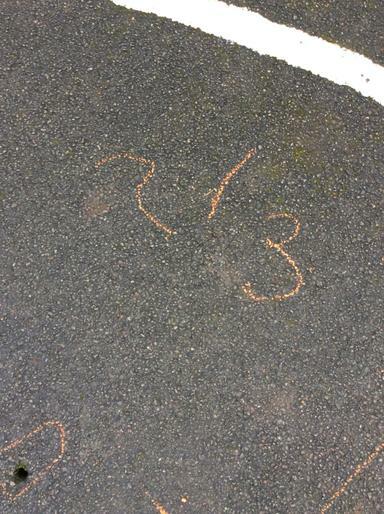 Our number this week was Seal Six! 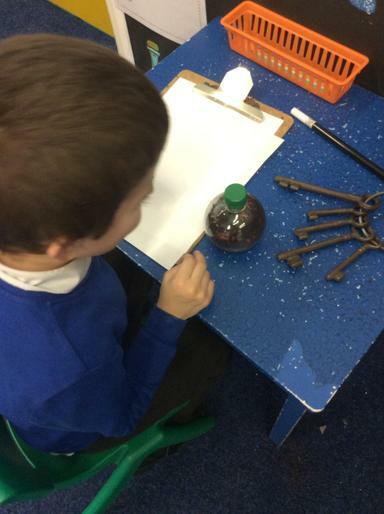 Week 9 - This week we explored Handa's surprise as our story. 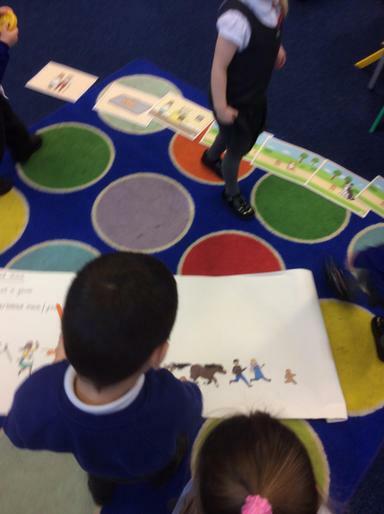 We looked at the setting of the story which is Kenya and the fruits in the story. 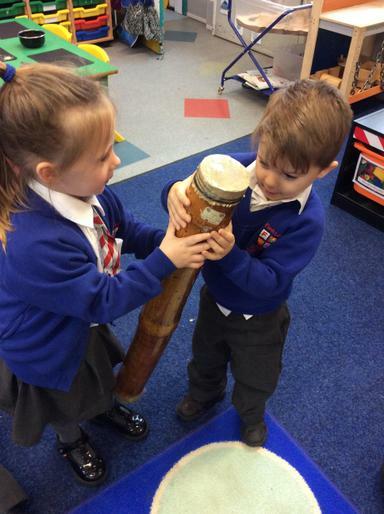 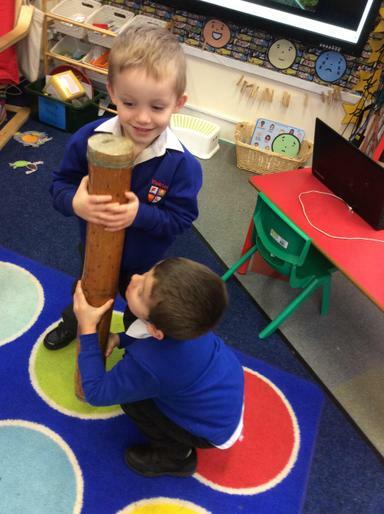 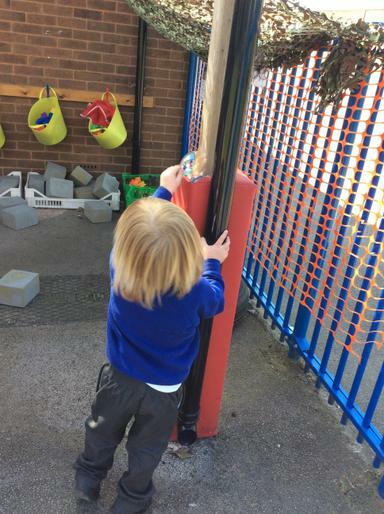 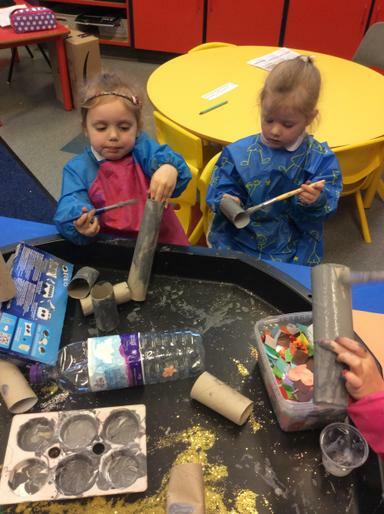 The children enjoyed exploring the sounds of the rain stick. 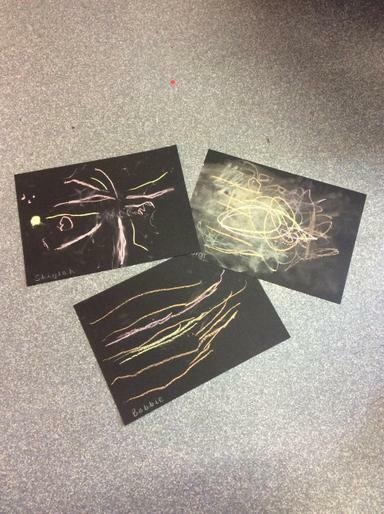 We also recreated firework pictures from the bonfire events we visited! 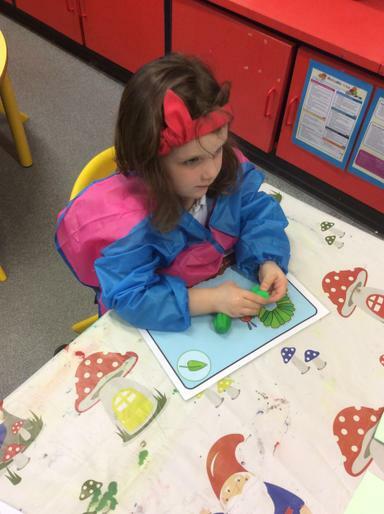 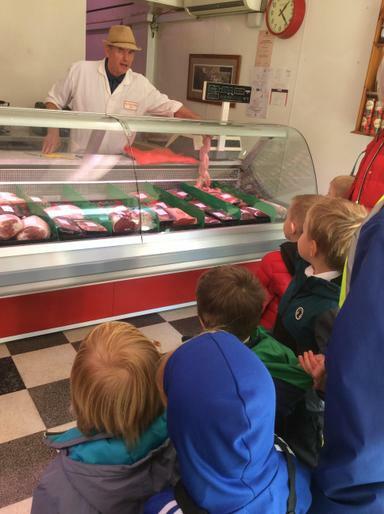 Week 8 - We have had great fun this week exploring our story Meg's Veg! 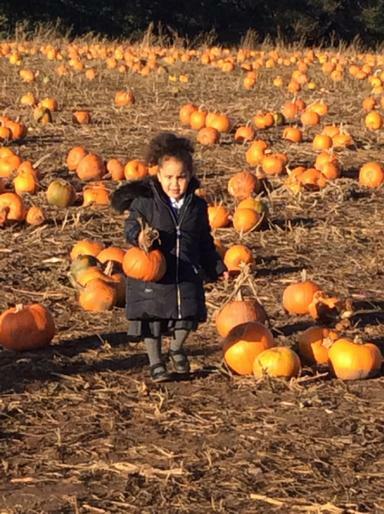 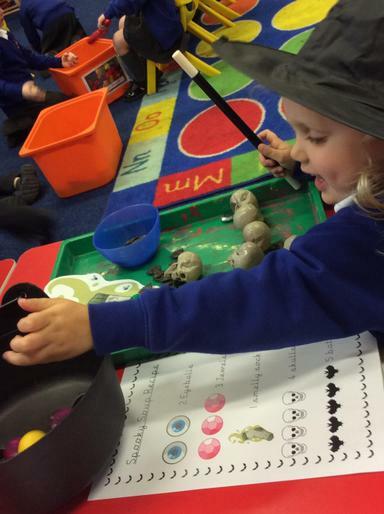 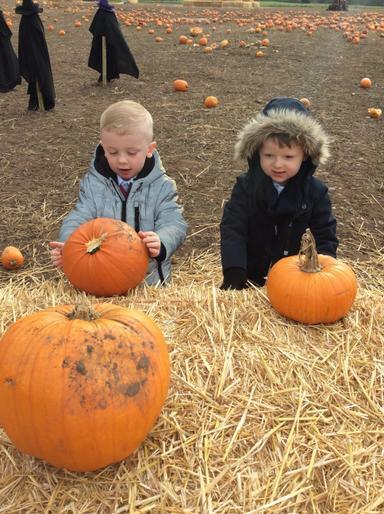 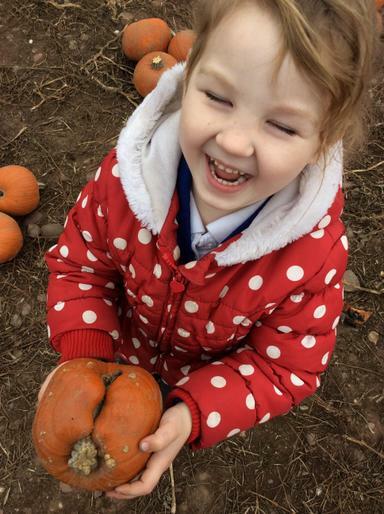 We have been spell writing, potion making and pumpkin picking! 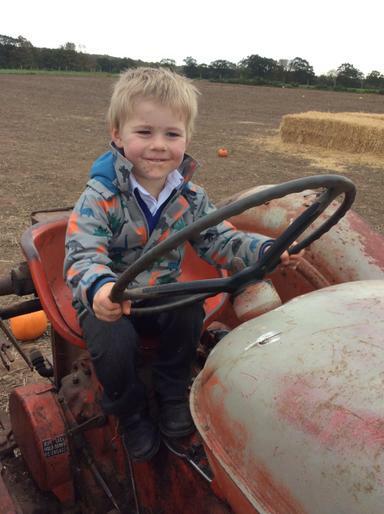 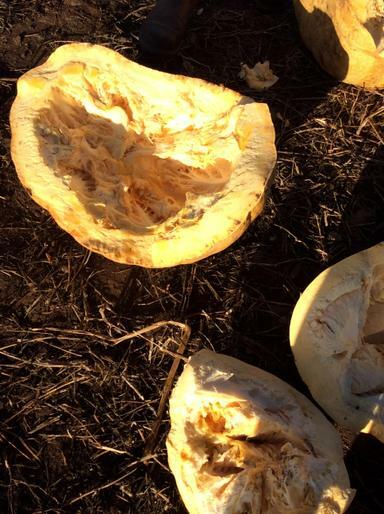 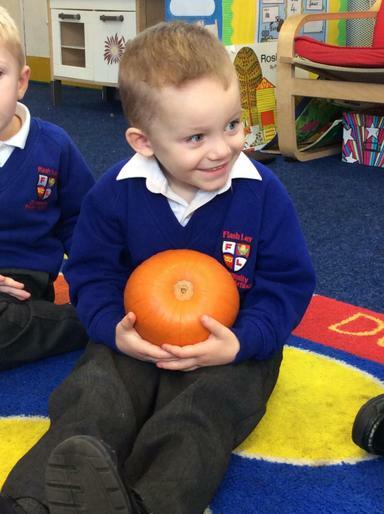 The children have been learning how pumpkins and other vegetables grow. 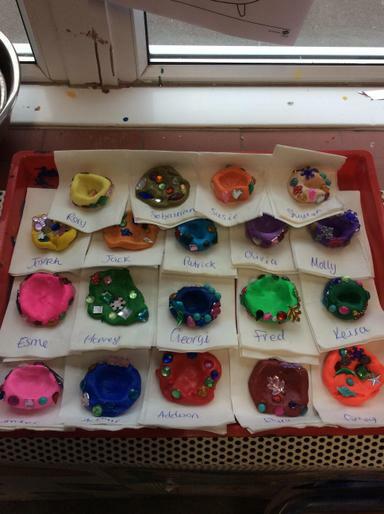 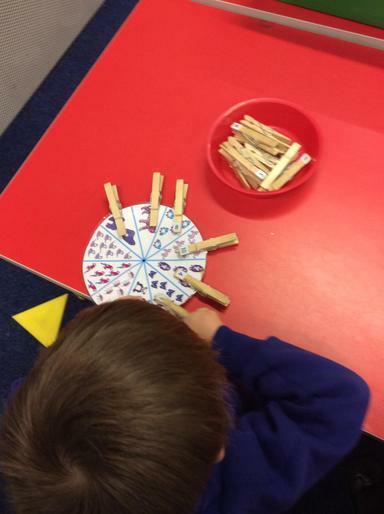 We have also celebrated Diwali making our own Diya lamps! 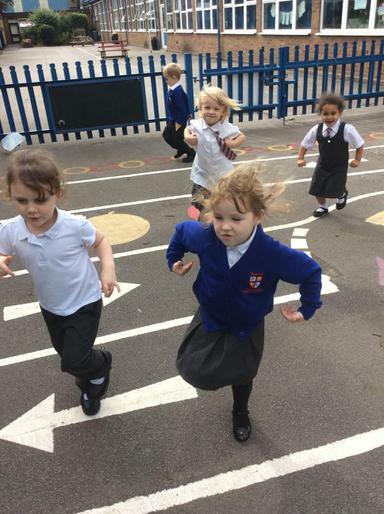 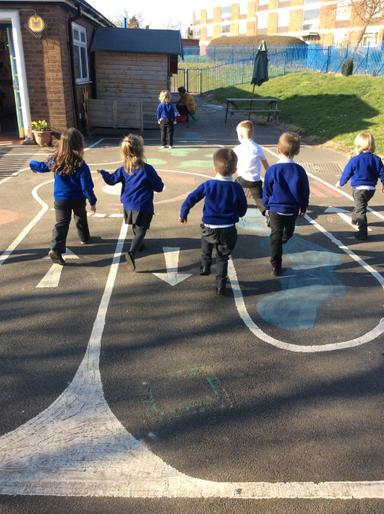 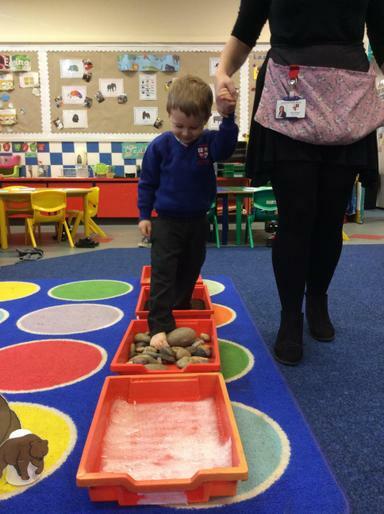 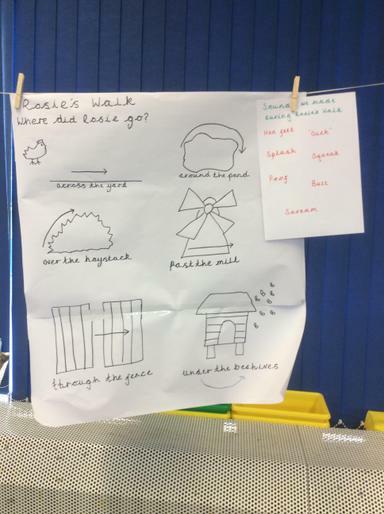 Week 7 - We have enjoyed the story 'Rosie's Walk' this week. 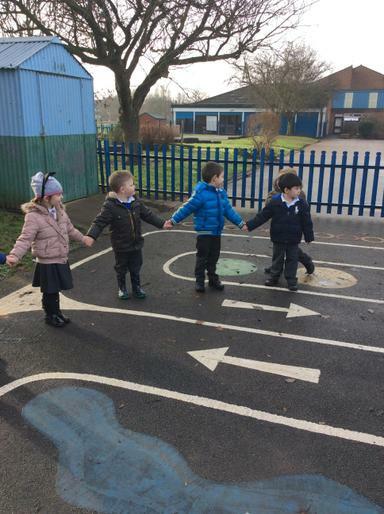 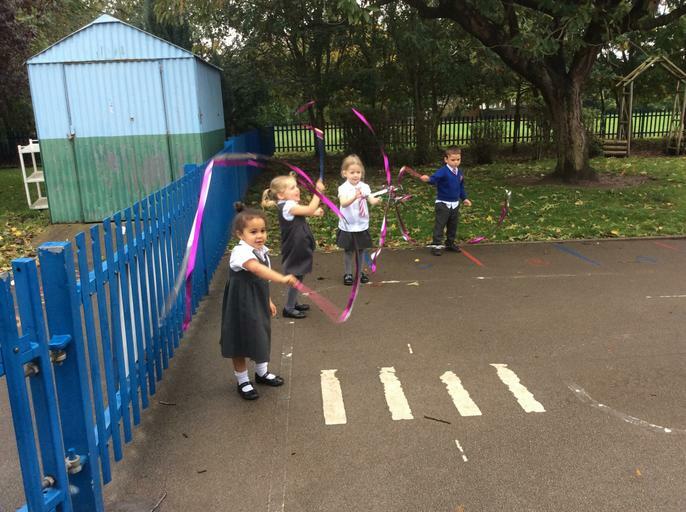 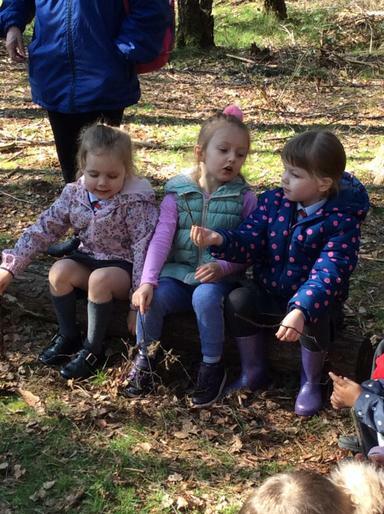 The children have explored the farm, drew a map of Rosie's walk and acted out the story using ribbon wands to add their own actions and sounds! 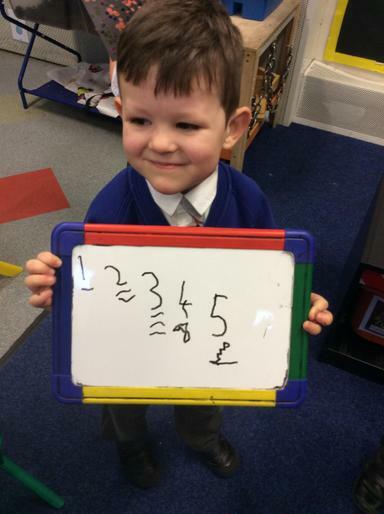 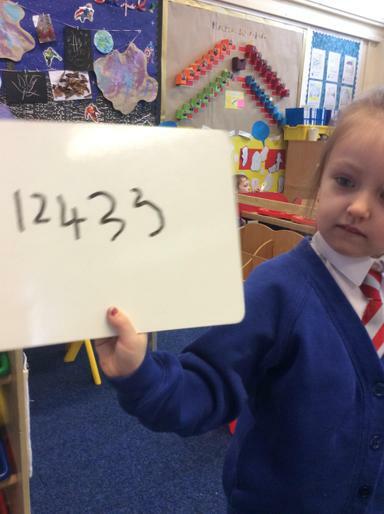 Our number of the week has been number three! 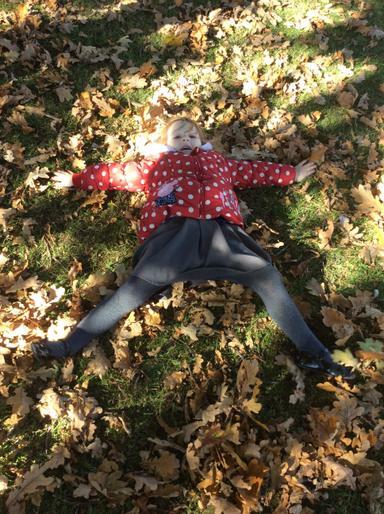 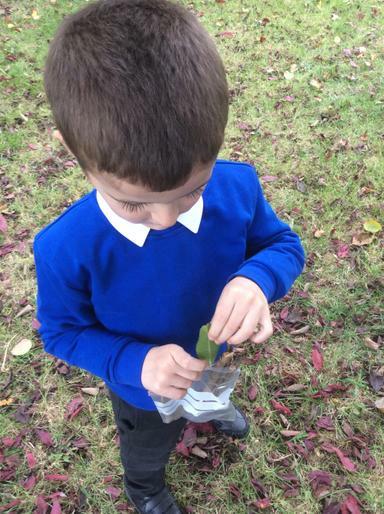 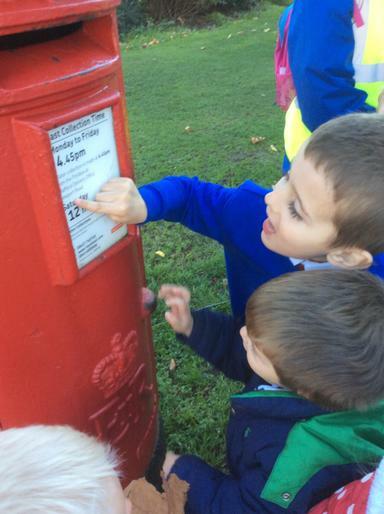 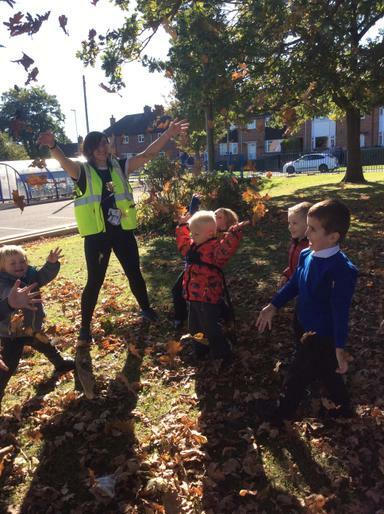 Week 6 - We explored Autumn this week. 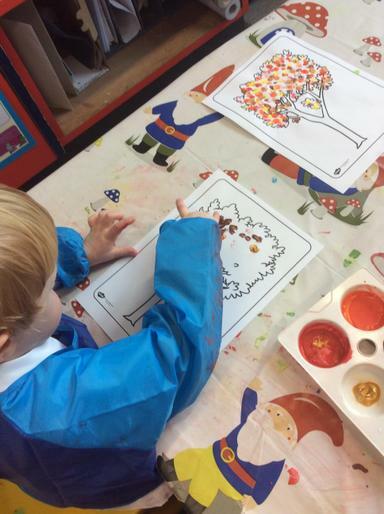 We visited the local shops on an Autumn walk, painted with Autumn colours and explored the world around us as the season changes. 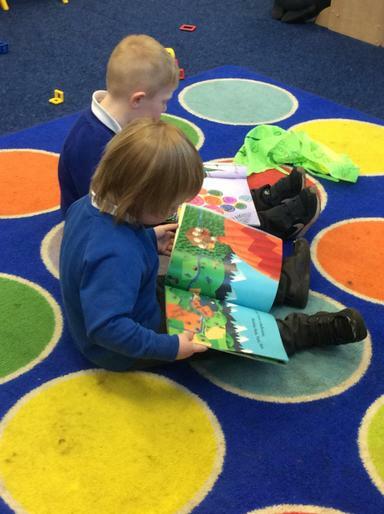 Week 5 - This week we are looking at one of our favourite stories, The Very Hungry Caterpillar by Eric Carle. 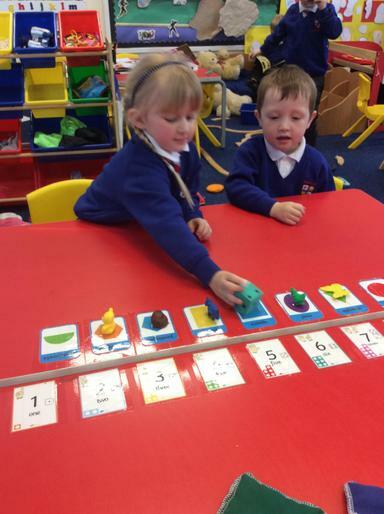 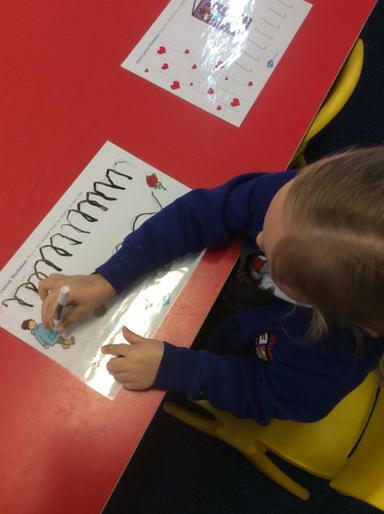 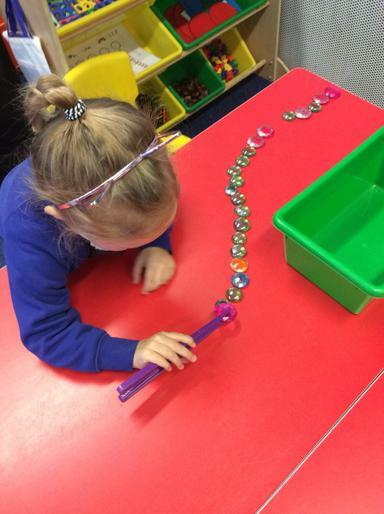 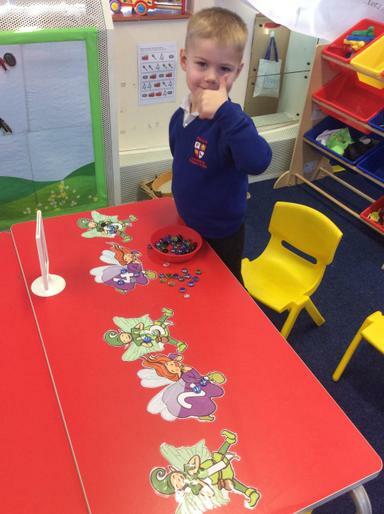 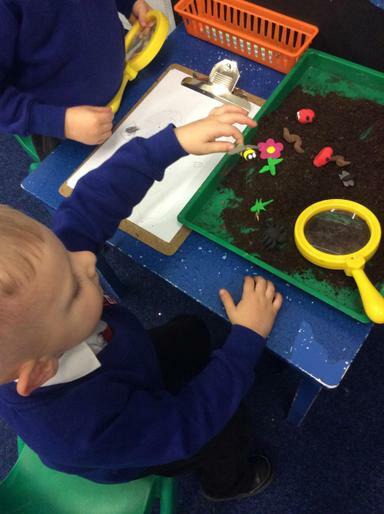 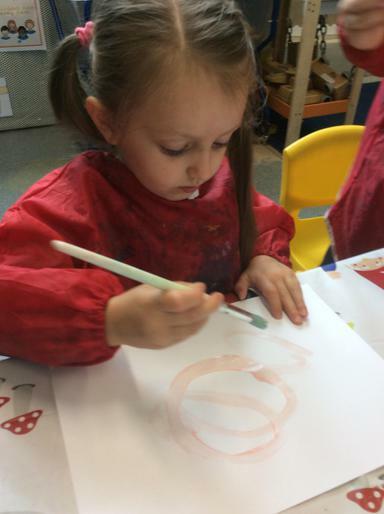 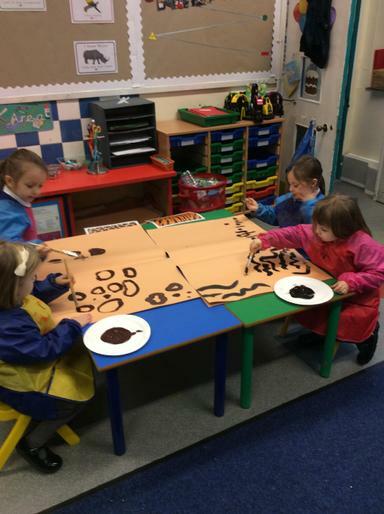 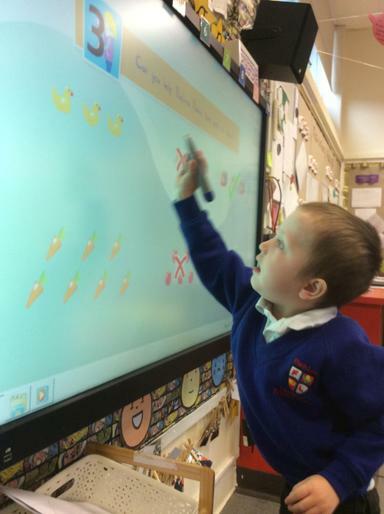 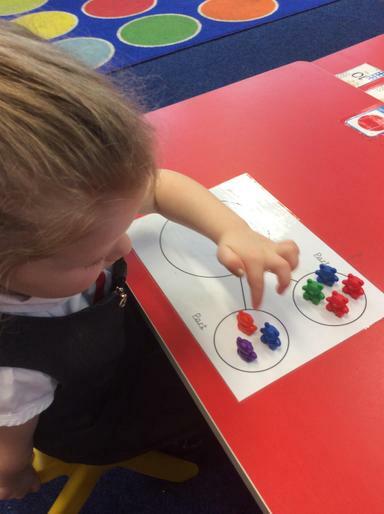 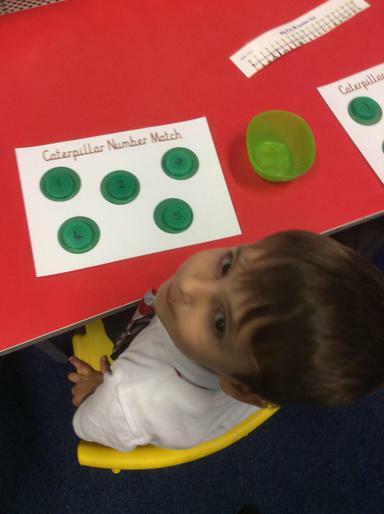 The children have been understanding pattern with caterpillar printing, sequencing with the days of the week and counting with the number of fruits the caterpillar ate! 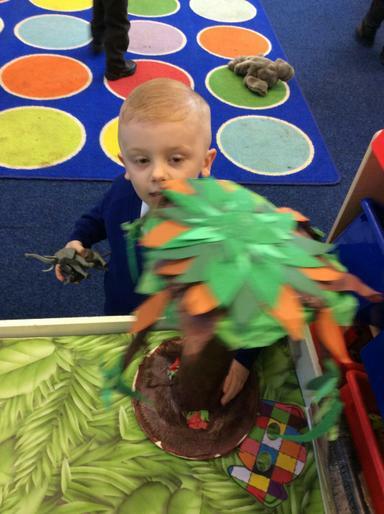 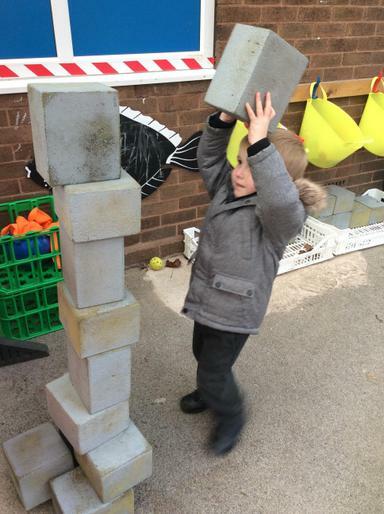 Week 4 - This week we have looked at our world! 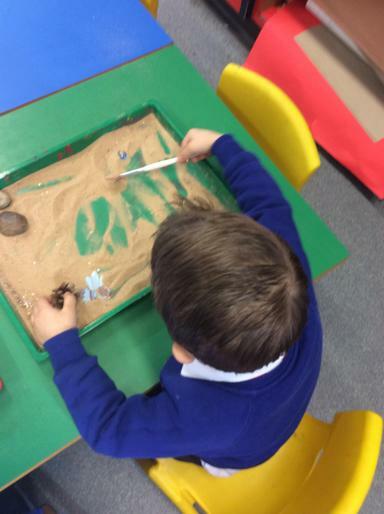 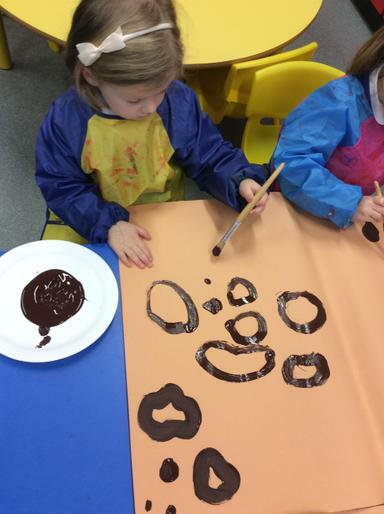 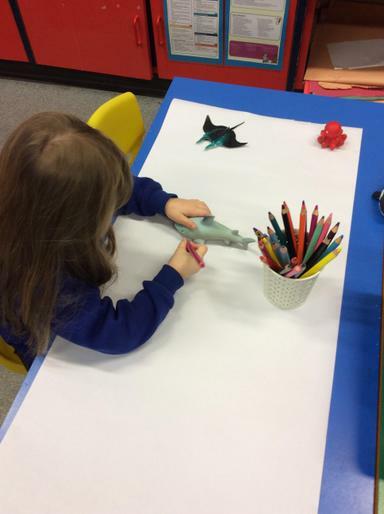 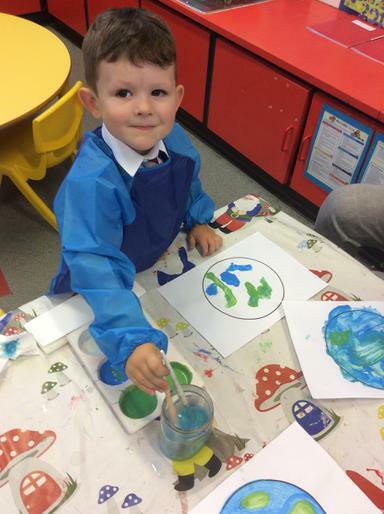 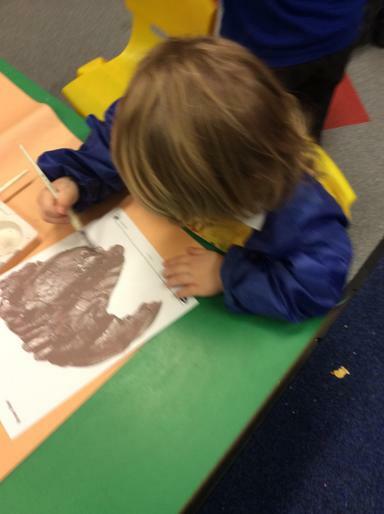 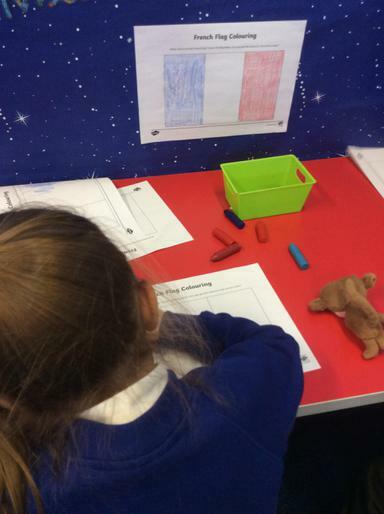 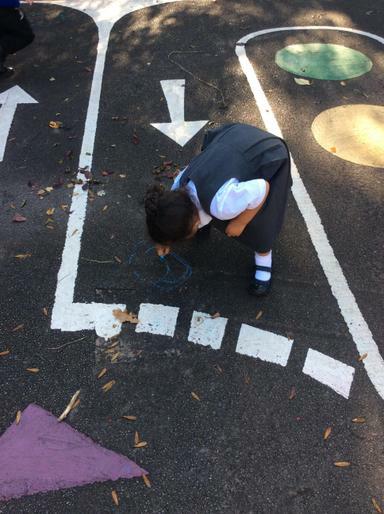 We explored France for European Languages Day, found out what lived in the ocean and painted our own planet Earth. 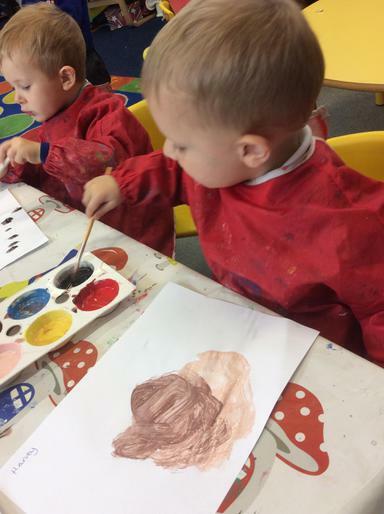 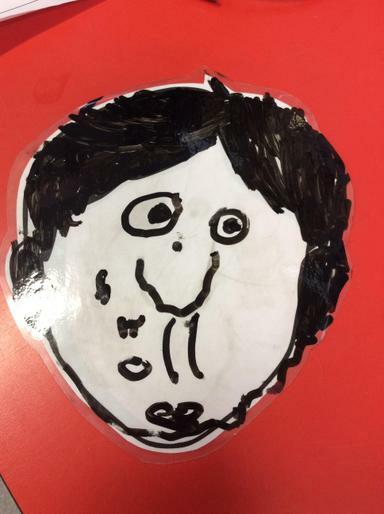 Week 3 - It was all about us this week as we drew and painted our own self portraits! 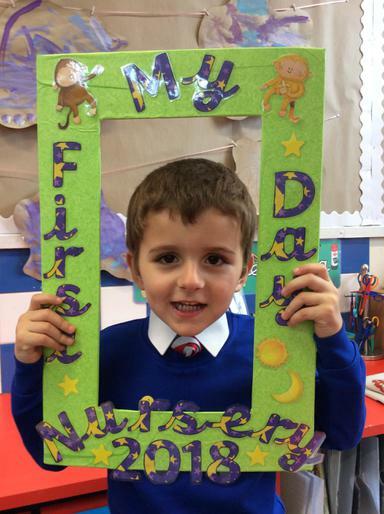 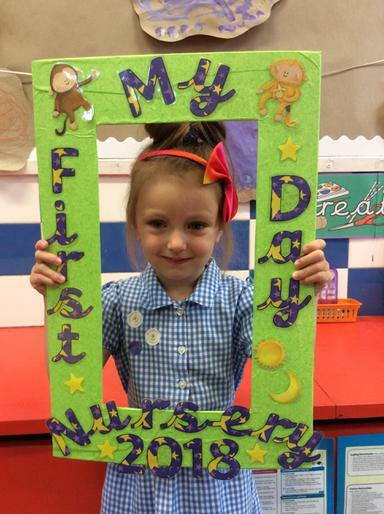 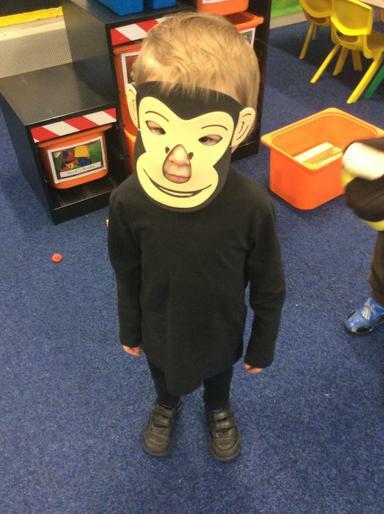 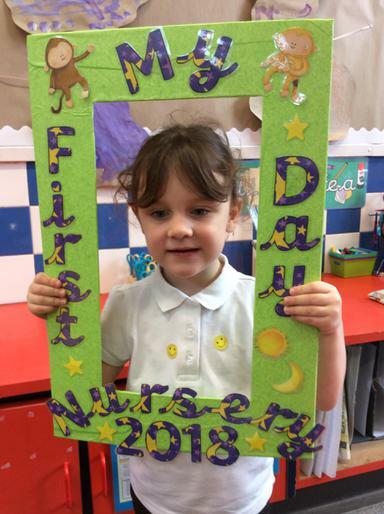 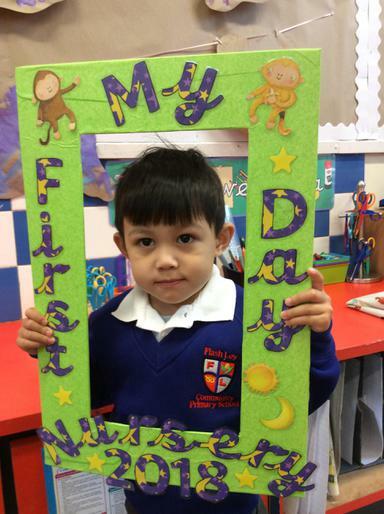 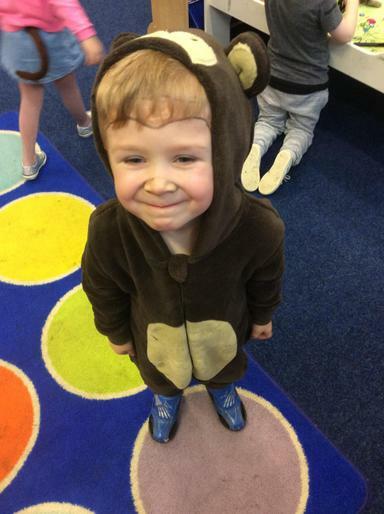 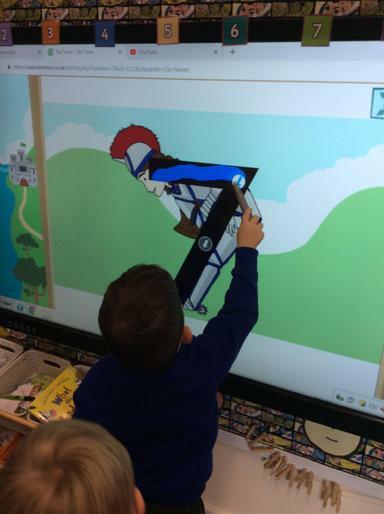 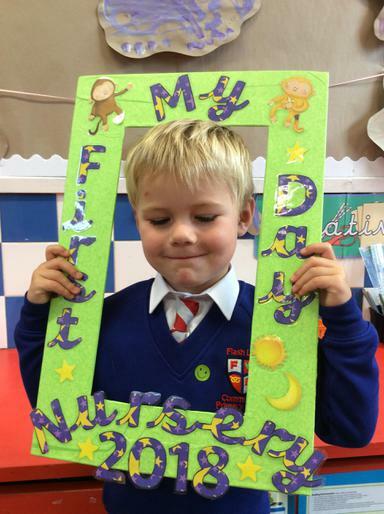 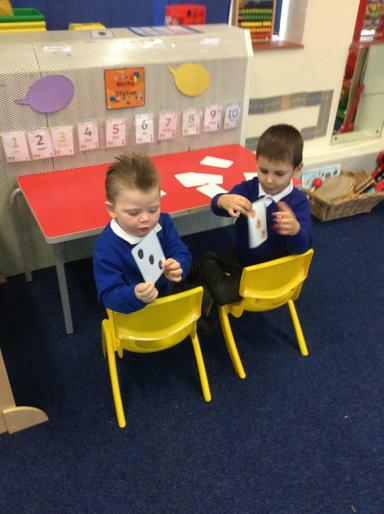 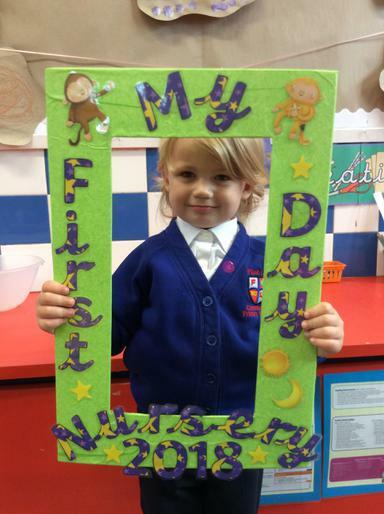 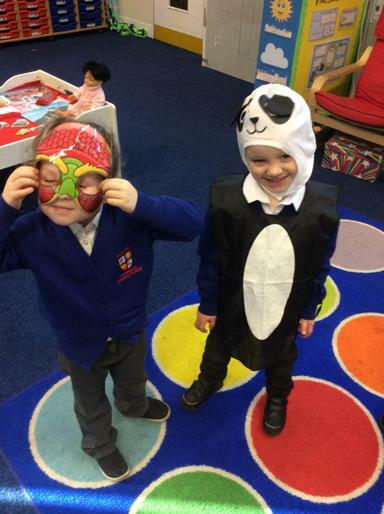 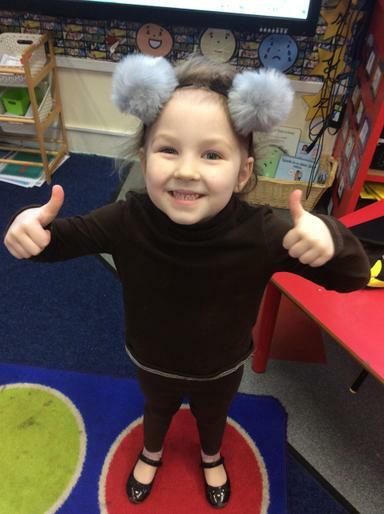 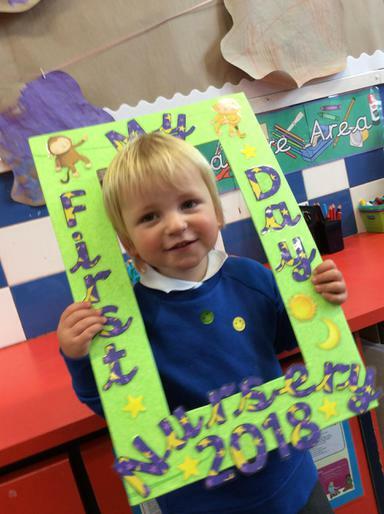 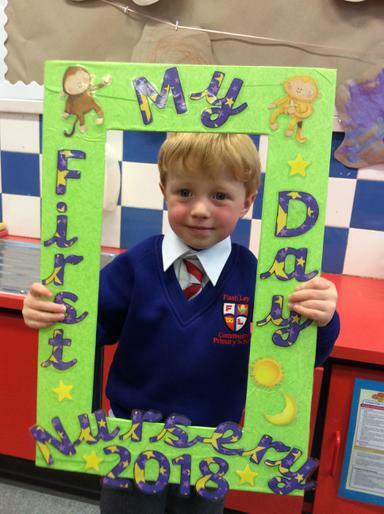 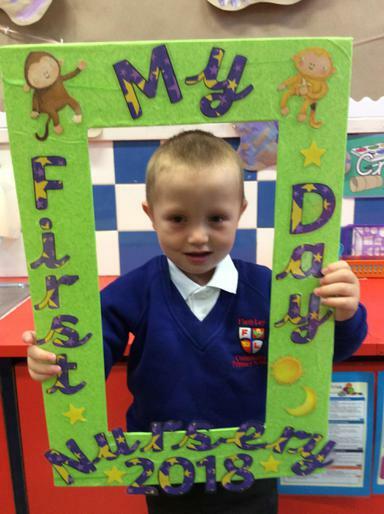 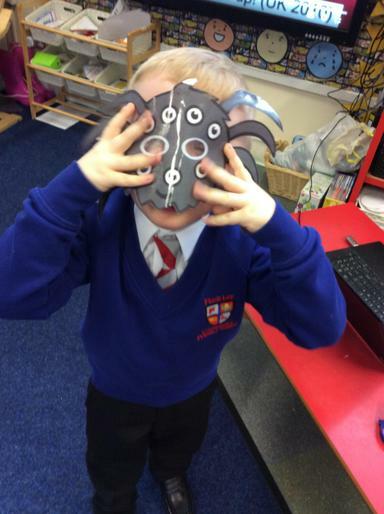 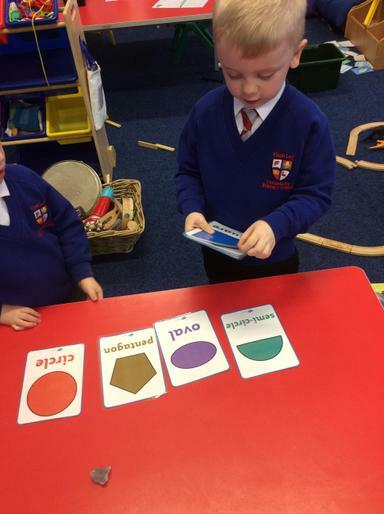 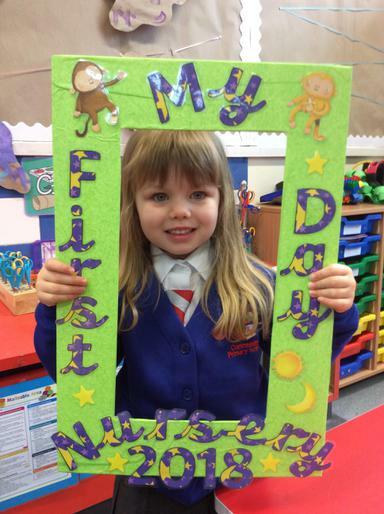 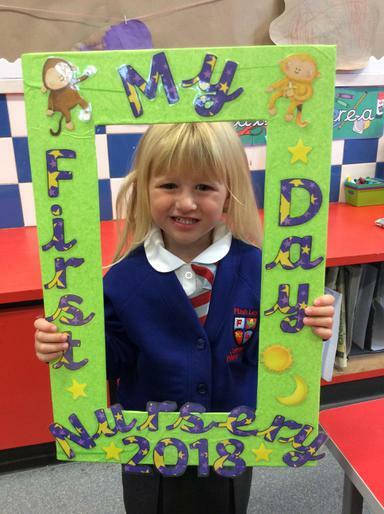 Week 2 - We have been monkeying around this week as we explore our class name. 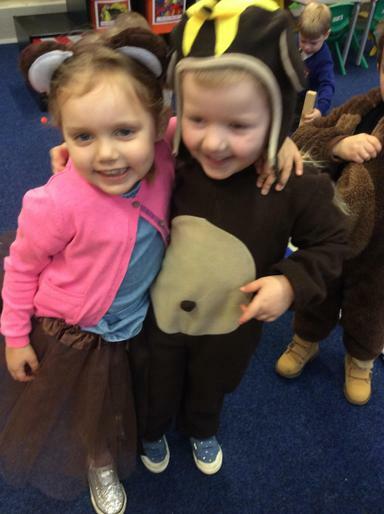 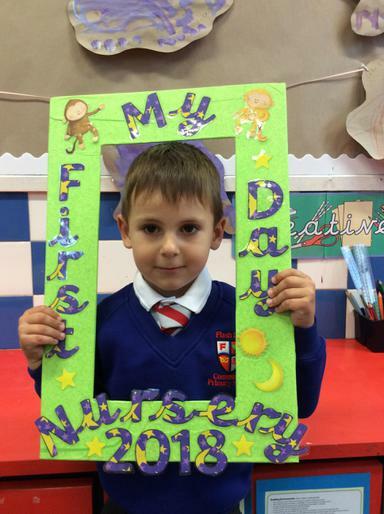 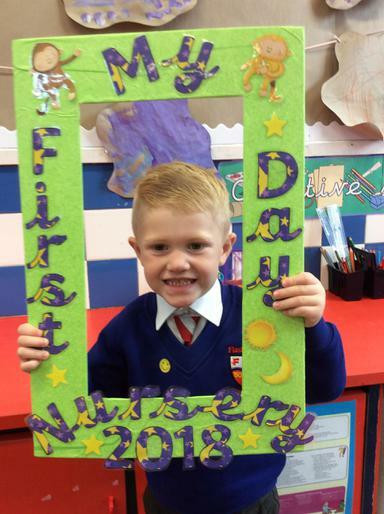 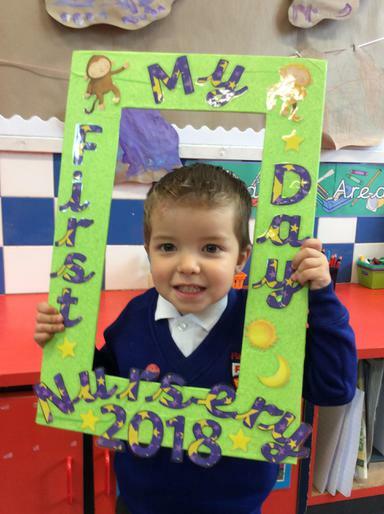 We are named after a Julia Donaldson book, Day Monkey, Night Monkey in which two monkeys are awake at very different times! 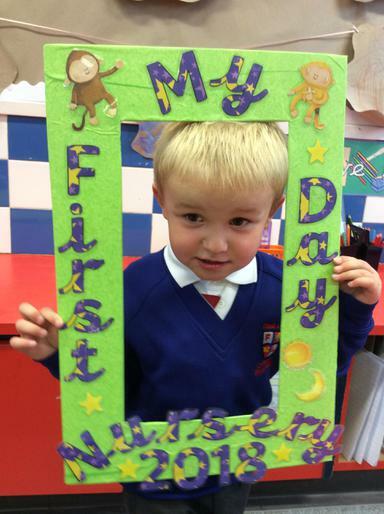 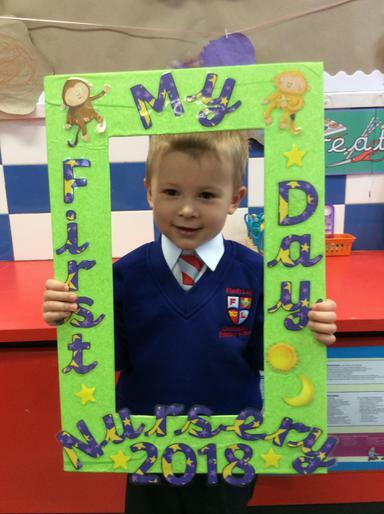 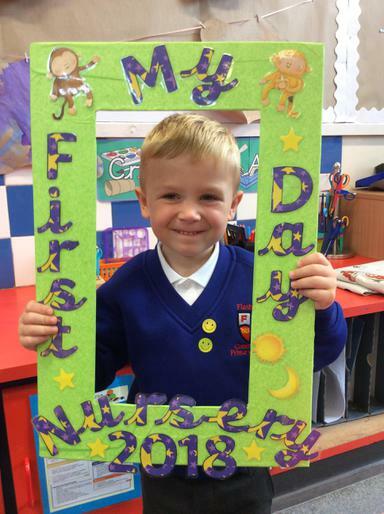 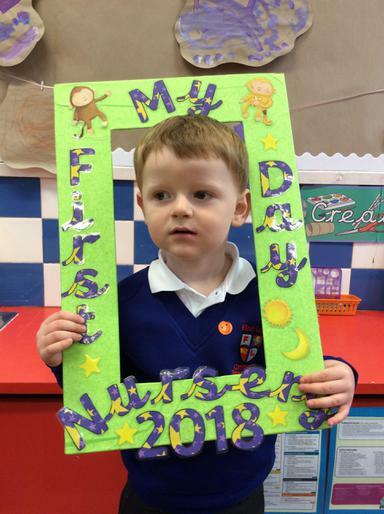 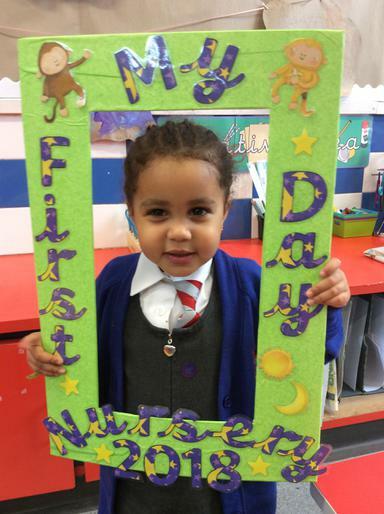 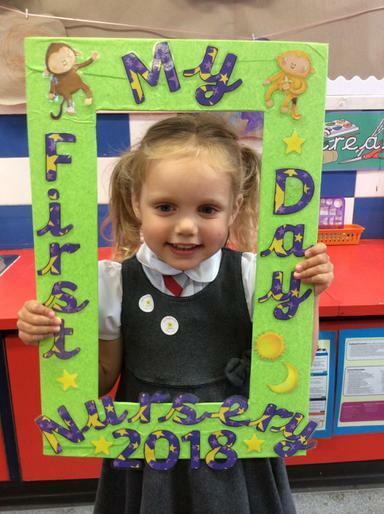 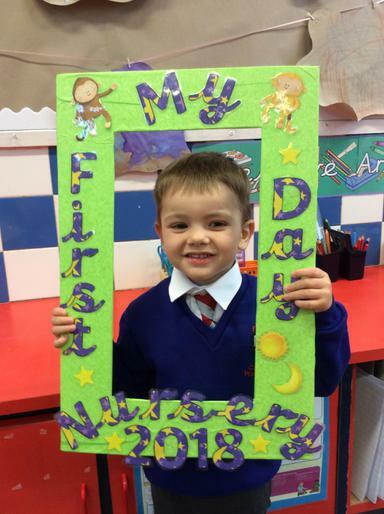 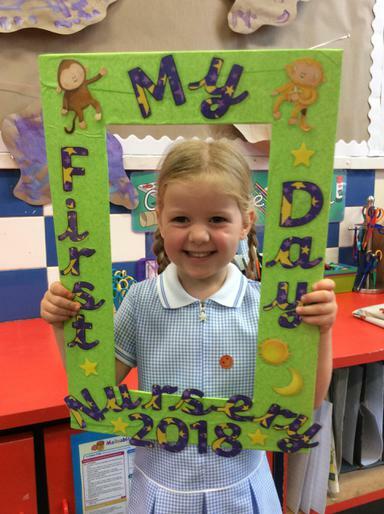 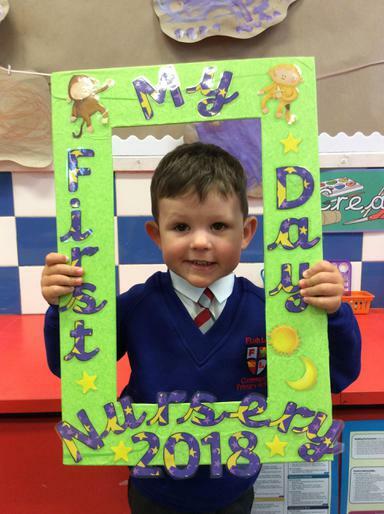 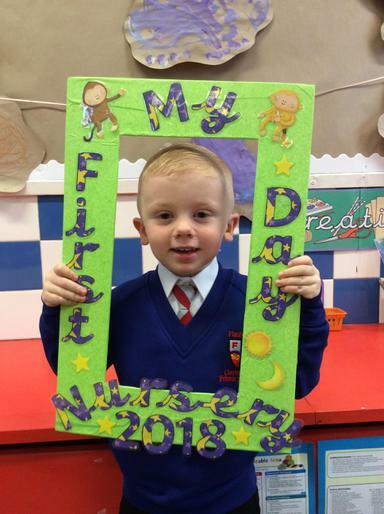 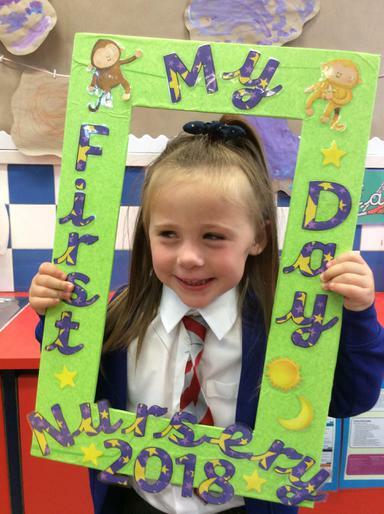 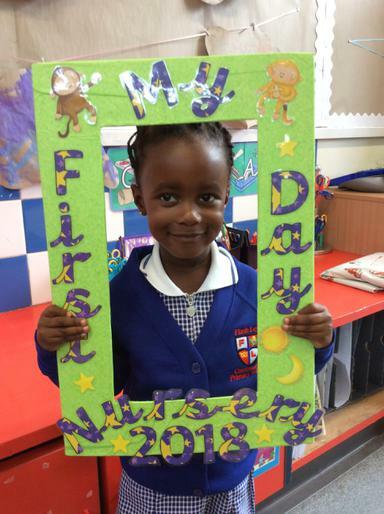 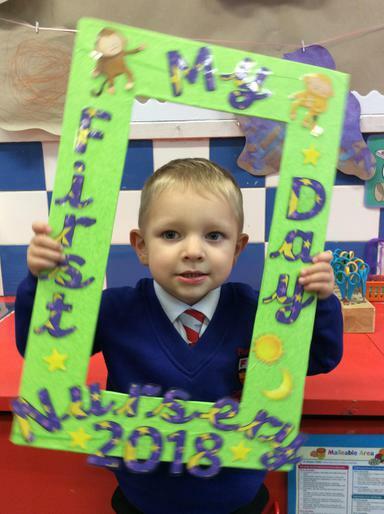 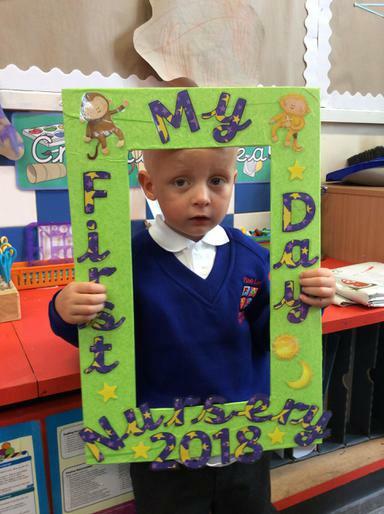 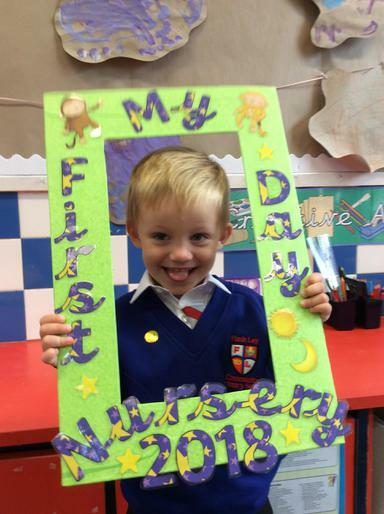 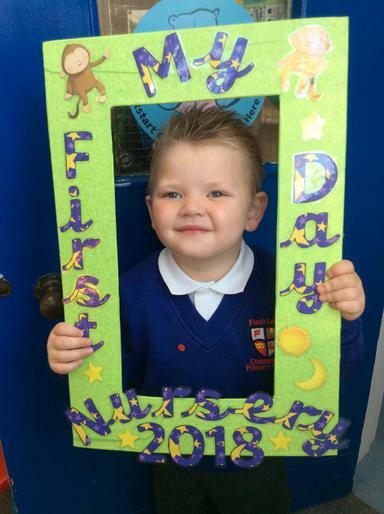 Week 1 - Settling into Nursery has been fun! 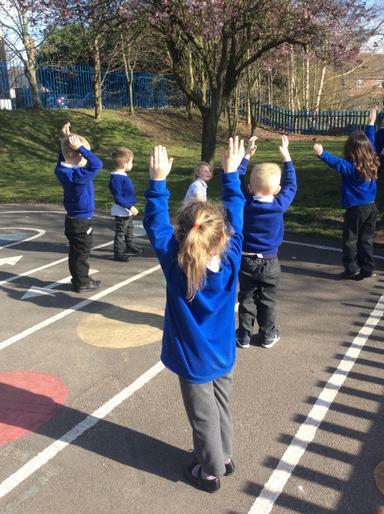 We have made new friends, learnt a new routine and settled well into school life!